The site of the Empire State Building, located in Midtown South on the west side of Fifth Avenue between West 33rd and 34th Streets, was originally part of an early 18th-century farm. It was later purchased by the Astor family, who built the Waldorf–Astoria Hotel on the site in the 1890s. The hotel remained in operation until the late 1920s, when it was sold to the Bethlehem Engineering Corporation, then to Empire State Inc., a business venture that included famous businessman and former General Motors executive, John J. Raskob, members of the du Pont family, and former New York governor Al Smith. The original design of the Empire State Building was for a 50-story office building. However, after fifteen revisions, the final design was for an 86-story 1,250-foot building, with an airship mast on top. This ensured it would be the world's tallest building, beating the Chrysler Building and 40 Wall Street, two other Manhattan skyscrapers under construction at the time that were also vying for that distinction. Demolition of the Waldorf–Astoria began in October 1929, and the foundation of the Empire State Building was excavated before demolition was even complete. Construction on the building itself started on March 17, 1930, with an average construction rate of four and a half floors per week. A well-coordinated schedule meant that the 86 stories were topped out on September 19; the mast was completed by November 21; and the building was opened on May 1, 1931, thirteen and a half months after the first steel beam was erected. Despite the publicity surrounding the building's construction, its owners failed to make a profit until the early 1950s. However, since its opening, the building's Art Deco architecture and open-air observation deck has made it a popular tourist attraction, with around 4 million visitors from around the world visiting the building's 86th and 102nd floor observatories every year. Since the mid-2010s, the Empire State Building has been undergoing improvements to improve access to its observation decks. The building stands within a mile of other major Midtown tourist attractions including Grand Central Terminal, Pennsylvania Station, Madison Square Garden, Koreatown, and Macy's Herald Square. The Empire State Building is located on the west side of Fifth Avenue in Manhattan, between 33rd and 34th Streets. Tenants enter the building through the Art Deco lobby located at 350 Fifth Avenue. Since August 2018, visitors to the Empire State Building Observatory use an entrance at 20 West 34th Street, replacing the previous Observatory entrance inside the Fifth Avenue lobby. Although physically located in South Midtown, a mixed residential and commercial area, the building is so large that it was assigned its own ZIP Code, 10118; as of 2012[update], it is one of 43 buildings in New York City that has its own ZIP Code. [b] The areas surrounding the Empire State Building are home to other major Manhattan landmarks as well, including Macy's at Herald Square on Sixth Avenue and 34th Street, Koreatown on 32nd Street between Fifth and Sixth Avenues, Penn Station and Madison Square Garden on Seventh Avenue between 32nd and 34th Streets, and the Flower District on 28th Street between Sixth and Seventh Avenues. The nearest New York City Subway stations are 34th Street–Penn Station at Seventh Avenue, two blocks west; 34th Street–Herald Square, one block west; and 33rd Street at Park Avenue, two blocks east. There is also a PATH station at 33rd Street and Sixth Avenue. To the east of the Empire State Building is Murray Hill, a neighborhood with a mix of residential, commercial, and entertainment activity. One block east of the Empire State Building, on Madison Avenue at 34th Street, is the New York Public Library's Science, Industry and Business Library, which is located on the same block as the City University of New York's Graduate Center. Bryant Park and the New York Public Library Main Branch are located six blocks north of the Empire State Building, on the block bounded by Fifth Avenue, Sixth Avenue, 40th Street, and 42nd Street. Grand Central Terminal is located two blocks east of the library's Main Branch, at Park Avenue and 42nd Street. The tract was originally part of Mary and John Murray's farm on Murray Hill. The earliest recorded major action on the site was during the American Revolutionary War, when General George Washington's troops retreated from the British following the Battle of Kip's Bay. In 1799, John Thompson (or Thomson; accounts vary) bought a 20-acre (8 ha) tract of land roughly bounded by present day Madison Avenue, 36th Street, Sixth Avenue, and 33rd Street, immediately north of the Caspar Samler farm. He paid a total of 482 British pounds for the parcel, equivalent to roughly $2,400 at the time, or about £38,226 ($47,565) today. [d] Thompson was said to have sold the farm to Charles Lawton for $10,000 (equal to $275,287 today) on September 24, 1825. The full details of this sale are unclear, as parts of the deed that certified the sale were later lost. In 1826, John Jacob Astor of the prominent Astor family bought the land from Lawton for $20,500. [e] The Astors also purchased a parcel from the Murrays. John Jacob's son William Backhouse Astor Sr. bought a half interest in the properties for $20,500 on July 28, 1827, securing a tract of land on Fifth Avenue from 32nd to 35th streets. On March 13, 1893, John Jacob Astor Sr's grandson William Waldorf Astor opened the Waldorf Hotel on the site with the help of hotelier George Boldt. On November 1, 1897, Waldorf's cousin, John Jacob Astor IV, opened the 16-story Astoria Hotel on an adjacent site. Together, the combined hotels had a total of 1,300 bedrooms making it the largest hotel in the world at the time. After Boldt died, in early 1918, the hotel lease was purchased by Thomas Coleman du Pont. By the 1920s, the hotel was becoming dated and the elegant social life of New York had moved much farther north than 34th Street. The Astor family decided to build a replacement hotel further uptown, and sold the hotel to Bethlehem Engineering Corporation in 1928 for $14–16 million. The hotel on the site of today's Empire State Building closed on May 3, 1929. Bethlehem Engineering Corporation originally intended to build a 25-story office building on the Waldorf–Astoria site. The company's president, Floyd De L. Brown, paid $100,000 of the $1 million down payment required to start construction on the tower, with the promise that the difference would be paid later. Brown borrowed $900,000 from a bank, but then defaulted on the loan. The building plans went through fifteen versions before the current plan was approved. 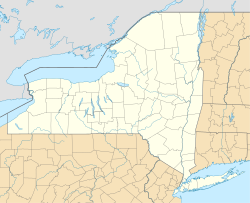 The land was then resold to Empire State Inc., a group of wealthy investors that included Louis G. Kaufman, Ellis P. Earle, John J. Raskob, Coleman du Pont, and Pierre S. du Pont. The name came from the state nickname for New York. Alfred E. Smith, a former Governor of New York and U.S. presidential candidate whose 1928 campaign had been managed by Raskob, was appointed head of the company. The group also purchased nearby land so they would have the 2 acres (1 ha) needed for the tower's base, with the combined plot measuring 425 feet (130 m) wide by 200 feet (61 m) long. The Empire State Inc. consortium was announced to the public in August 1929. Empire State Inc. contracted William F. Lamb, of architectural firm Shreve, Lamb and Harmon, to create the building design. Lamb produced the building drawings in just two weeks using the firm's earlier designs for the Reynolds Building in Winston-Salem, North Carolina as the basis. Concurrently, Lamb's partner Richmond Shreve created "bug diagrams" of the project requirements. The 1916 Zoning Act forced Lamb to design a structure that incorporated setbacks resulting in the lower floors being larger than the upper floors. [f] Consequently, the tower was designed from the top down, giving it a "pencil"-like shape. The original plan of the building was 50 stories, but was later increased to 60 and then 80 stories. Height restrictions were placed on nearby buildings to ensure that the top fifty floors of the planned 80-story, 1,000-foot-tall (300 m) building would have unobstructed views of the city. The New York Times lauded the site's proximity to mass transit, with the Brooklyn–Manhattan Transit's 34th Street station and the Hudson and Manhattan Railroad's 33rd Street terminal one block away, as well as Penn Station two blocks away and the Grand Central Terminal nine blocks away at its closest. It also praised the 3,000,000 square feet (280,000 m2) of proposed floor space near "one of the busiest sections in the world". While plans for the Empire State Building were being finalized, an intense competition in New York for the title of "world's tallest building" was underway. 40 Wall Street (then the Bank of Manhattan Building) and the Chrysler Building in Manhattan both vied for this distinction and were already under construction when work began on the Empire State Building. The "Race into the Sky", as popular media called it at the time, was representative of the country's optimism in the 1920s, fueled by the building boom in major cities. The 40 Wall Street tower was revised, in April 1929, from 840 feet (260 m) to 925 feet (282 m) making it the world's tallest. The Chrysler Building added its 185-foot (56 m) steel tip to its roof in October 1929, thus bringing it to a height of 1,046 feet (319 m) and greatly exceeding the height of 40 Wall Street. The Chrysler Building's developer, Walter Chrysler, realized that his tower's height would exceed the Empire State Building's as well, having instructed his architect, William Van Alen, to change the Chrysler's original roof from a stubby Romanesque dome to a narrow steel spire. Raskob, wishing to have the Empire State Building be the world's tallest, reviewed the plans and had five floors added as well as a spire; however, the new floors would need to be set back because of projected wind pressure on the extension. On November 18, 1929, Smith acquired a lot at 27–31 West 33rd Street, adding 75 feet (23 m) to the width of the proposed office building's site. Two days later, Smith announced the updated plans for the skyscraper that included an observation deck on the 86th-floor roof at a height of 1,050 feet (320 m), higher than the Chrysler's 71st-floor observation deck. The program was short enough—a fixed budget, no space more than 28 feet from window to corridor, as many stories of such space as possible, an exterior of limestone, and completion date of [May 1], 1931, which meant a year and six months from the beginning of sketches. The contractors were Starrett Brothers and Eken, Paul and William A. Starrett and Andrew J. Eken, who had also constructed other New York City buildings such as the original Stuyvesant Town, Starrett City and Trump Tower. The project was financed primarily by Raskob and Pierre du Pont, while James Farley's General Builders Supply Corporation supplied the building materials. John W. Bowser was the construction superintendent of the project, and the structural engineer of the building was Homer G. Balcom. The tight completion schedule necessitated the commencement of construction even though the design had yet to be finalized. Demolition of the old Waldorf–Astoria began on October 1, 1929. Stripping the building down was an arduous process, as the hotel had been constructed using more rigid material than earlier buildings had been. Furthermore, the old hotel's granite, wood chips, and "'precious' metals such as lead, brass, and zinc" were not in high demand resulting in issues with disposal. Most of the wood was deposited into a woodpile on nearby 30th Street or was burned in a swamp elsewhere. Much of the other materials that made up the old hotel, including the granite and bronze, were dumped into the Atlantic Ocean near Sandy Hook, New Jersey. By the time the hotel's demolition started, Raskob had secured the required funding for the construction of the building. The plan was to start construction later that year but, on October 24, the New York Stock Exchange suffered a sudden crash marking the beginning of the decade-long Great Depression. Despite the economic downturn, Raskob refused to cancel the project because of the progress that had been made up to that point. Neither Raskob, who had ceased speculation in the stock market the previous year, nor Smith, who had no stock investments, suffered financially in the crash. However, most of the investors were affected and as a result, in December 1929, Empire State Inc. obtained a $27.5 million loan from Metropolitan Life Insurance Company so construction could begin. The stock market crash resulted in no demand in new office space, Raskob and Smith nonetheless started construction, as canceling the project would have resulted in greater losses for the investors. A structural steel contract was awarded on January 12, 1930, with excavation of the site beginning ten days later on January 22, before the old hotel had been completely demolished. Two twelve-hour shifts, consisting of 300 men each, worked continuously to dig the 55-foot (17 m) foundation. Small pier holes were sunk into the ground to house the concrete footings that would support the steelwork. Excavation was nearly complete by early March, and construction on the building itself started on March 17, with the builders placing the first steel columns on the completed footings before the rest of the footings had been finished. Around this time, Lamb held a press conference on the building plans. He described the reflective steel panels parallel to the windows, the large-block Indiana Limestone facade that was slightly more expensive than smaller bricks, and the tower's lines and rise. Four colossal columns, intended for installation in the center of the building site, were delivered; they would support a combined 10,000,000 pounds (4,500,000 kg) when the building was finished. The structural steel was pre-ordered and pre-fabricated in anticipation of a revision to the city's building code that would have allowed the Empire State Building's structural steel to carry 18,000 pounds per square inch (124,106 kPa), up from 16,000 pounds per square inch (110,316 kPa), thus reducing the amount of steel needed for the building. Although the 18,000-psi regulation had been safely enacted in other cities, Mayor Jimmy Walker did not sign the new codes into law until March 26, 1930, just before construction was due to commence. The first steel framework was installed on April 1, 1930. From there, construction proceeded at a rapid pace; during one stretch of 10 working days, the builders erected fourteen floors. This was made possible through precise coordination of the building's planning, as well as the mass production of common materials such as windows and spandrels. On one occasion, when a supplier could not provide timely delivery of dark Hauteville marble, Starrett switched to using Rose Famosa marble from a German quarry that was purchased specifically to provide the project with sufficient marble. The scale of the project was massive, with trucks carrying "16,000 partition tiles, 5,000 bags of cement, 450 cubic yards [340 m3] of sand and 300 bags of lime" arriving at the construction site every day. There were also cafes and concession stands on five of the incomplete floors so workers did not have to descend to the ground level to eat lunch. Temporary water taps were also built so workers did not waste time buying water bottles from the ground level. Additionally, carts running on a small railway system transported materials from the basement storage to elevators that brought the carts to the desired floors where they would then be distributed throughout that level using another set of tracks. The 57,480 short tons (51,320 long tons) of steel ordered for the project was the largest-ever single order of steel at the time, comprising more steel than was ordered for the Chrysler Building and 40 Wall Street combined. According to historian John Tauranac, building materials were sourced from numerous, and distant, sources with "limestone from Indiana, steel girders from Pittsburgh, cement and mortar from upper New York State, marble from Italy, France, and England, wood from northern and Pacific Coast forests, [and] hardware from New England." The facade, too, used a variety of material, most prominently Indiana limestone but also Swedish black granite, terracotta, and brick. By June 20, the skyscraper's supporting steel structure had risen to the 26th floor, and by July 27, half of the steel structure had been completed. Starrett Bros. and Eken endeavored to build one floor a day in order to speed up construction, a goal that they almost reached with their pace of ​4 1⁄2 stories per week; prior to this, the fastest pace of construction for a building of similar height had been ​3 1⁄2 stories per week. While construction progressed, the final designs for the floors were being designed from the ground up (as opposed to the general design, which had been from the roof down). Some of the levels were still undergoing final approval, with several orders placed within an hour of a plan being finalized. On September 10, as steelwork was nearing completion, Smith laid the building's cornerstone during a ceremony attended by thousands. The stone contained a box with contemporary artifacts including the previous day's New York Times, a U.S. currency set containing all denominations of notes and coins minted in 1930, a history of the site and building, and photographs of the people involved in construction. The steel structure was topped out at 1,048 feet (319 m) on September 19, twelve days ahead of schedule and 23 weeks after the start of construction. Workers raised a flag atop the 86th floor to signify this milestone. Afterward, work on the building's interior and crowning mast commenced. The mooring mast topped out on November 21, two months after the steelwork had been completed. Meanwhile, work on the walls and interior was progressing at a quick pace, with exterior walls built up to the 75th floor by the time steelwork had been built to the 95th floor. The majority of the facade was already finished by the middle of November. Because of the building's height, it was deemed infeasible to have many elevators or large elevator cabins, so the builders contracted with the Otis Elevator Company to make 66 cars that could speed at 1,200 feet per minute (366 m/min), which represented the largest-ever elevator order at the time. In addition to the time constraint builders had, there were also space limitations because construction materials had to be delivered quickly, and trucks needed to drop off these materials without congesting traffic. This was solved by creating a temporary driveway for the trucks between 33rd and 34th Streets, and then storing the materials in the building's first floor and basements. Concrete mixers, brick hoppers, and stone hoists inside the building ensured that materials would be able to ascend quickly and without endangering or inconveniencing the public. At one point, over 200 trucks made material deliveries at the building site every day. A series of relay and erection derricks, placed on platforms erected near the building, lifted the steel from the trucks below and installed the beams at the appropriate locations. The Empire State Building was structurally completed on April 11, 1931, twelve days ahead of schedule and 410 days after construction commenced. Al Smith shot the final rivet, which was made of solid gold. The project involved more than 3,500 workers at its peak, including 3,439 on a single day, August 14, 1930. Many of the workers were Irish and Italian immigrants, with a sizable minority of Mohawk ironworkers from the Kahnawake reserve near Montreal. According to official accounts, five workers died during the construction, although the New York Daily News gave reports of 14 deaths and a headline in the socialist magazine The New Masses spread unfounded rumors of up to 42 deaths. The Empire State Building cost $40,948,900 to build, including demolition of the Waldorf–Astoria (equivalent to $554,644,100 in 2018). This was lower than the $60 million budgeted for construction. Lewis Hine captured many photographs of the construction, documenting not only the work itself but also providing insight into the daily life of workers in that era. Hine's images were used extensively by the media to publish daily press releases. 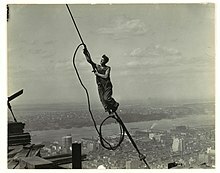 According to the writer Jim Rasenberger, Hine "climbed out onto the steel with the ironworkers and dangled from a derrick cable hundreds of feet above the city to capture, as no one ever had before (or has since), the dizzy work of building skyscrapers". In Rasenberger's words, Hine turned what might have been an assignment of "corporate flak" into "exhilarating art". These images were later organized into their own collection. Onlookers were enraptured by the sheer height at which the steelworkers operated. New York magazine wrote of the steelworkers: "Like little spiders they toiled, spinning a fabric of steel against the sky". The Empire State Building officially opened on May 1, 1931, forty five days ahead of its projected opening date. The opening was marked with an event featuring United States President Herbert Hoover, who turned on the building's lights with the ceremonial button push from Washington, D.C.. Over 350 guests attended the opening ceremony, and following luncheon, at the 86th floor including Jimmy Walker, Governor Franklin D. Roosevelt, and Al Smith. An account from that day stated that the view from the luncheon was obscured by a fog, with other landmarks such as the Statue of Liberty being "lost in the mist" enveloping New York City. The building officially opened the next day. Advertisements for the building's observatories were placed in local newspapers, while nearby hotels also capitalized on the events by releasing advertisements that lauded their proximity to the newly opened tower. According to The New York Times, builders and real estate speculators predicted that the 1,250-foot-tall (380 m) Empire State Building would be the world's tallest building "for many years", thus ending the great New York City skyscraper rivalry. At the time, most engineers agreed that it would be difficult to build a building taller than 1,200 feet (370 m), even with the hardy Manhattan bedrock as a foundation. Technically, it was believed possible to build a tower of up to 2,000 feet (610 m), but it was deemed uneconomical to do so, especially during the Great Depression. As the tallest building in the world, at that time, and the first one to exceed 100 floors, the Empire State Building became an icon of the city and, ultimately, of the nation. The Empire State Building's opening coincided with the Great Depression in the United States, and as a result much of its office space was vacant from its opening. In the first year, only 23% of the available space was rented, as compared to the early 1920s, where the average building would have occupancy of 52% upon opening and 90% rented within five years. The lack of renters led New Yorkers to deride the building as the "Empty State Building". Jack Brod, one of the building's longest resident tenants, co-established the Empire Diamond Corporation with his father in the building in mid-1931 and rented space in the building until he died in 2008. Brod recalled that there were only about 20 tenants at the time of opening, including him, and that Al Smith was the only real tenant in the space above his seventh-floor offices. Generally, during the early 1930s, it was rare for more than a single office space to be rented in the building, despite Smith's and Raskob's aggressive marketing efforts in the newspapers and to anyone they knew. The building's lights were continuously left on, even in the unrented spaces, to give the impression of occupancy. This was exacerbated by competition from Rockefeller Center as well as from buildings on 42nd Street, which, when combined with the Empire State Building, resulted in surplus of office space in a slow market during the 1930s. Aggressive marketing efforts served to reinforce the Empire State Building's status as the world's tallest. The observatory was advertised in local newspapers as well as on railroad tickets. The building became a popular tourist attraction, with one million people each paying one dollar to ride elevators to the observation decks in 1931. In its first year of operation, the observation deck made approximately $2 million in revenue, as much as its owners made in rent that year. By 1936, the observation deck was crowded on a daily basis, with food and drink available for purchase at the top, and by 1944 the tower had received its 5 millionth visitor. In 1931, NBC took up tenancy, leasing space on the 85th floor for radio broadcasts. From the outset the building was in debt, losing $1 million per year by 1935. Real estate developer Seymour Durst recalled that the building was so underused in 1936 that there was no elevator service above the 45th floor, as the building above the 41st floor was empty except for the NBC offices and the Raskob/Du Pont offices on the 81st floor. Per the original plans, the Empire State Building's spire was intended to be an airship docking station. Raskob and Smith had proposed dirigible ticketing offices and passenger waiting rooms on the 86th floor, while the airships themselves would be tied to the spire at the equivalent of the building's 106th floor. An elevator would ferry passengers from the 86th to the 101st floor[g] after they had checked in on the 86th floor, after which passengers would have climbed steep ladders to board the airship. The idea, however, was impractical and dangerous due to powerful updrafts caused by the building itself, the wind currents across Manhattan, and the spires of nearby skyscrapers. Furthermore, even if the airship were to successfully navigate all these obstacles, its crew would have to jettison some ballast by releasing water onto the streets below in order to maintain stability, and then tie the craft's nose to the spire with no mooring lines securing the tail end of the craft. On September 15, 1931, in the first and only instance of an airship using the building's mast, a small commercial United States Navy airship circled 25 times in 45 miles per hour (72 km/h) winds. The airship then attempted to dock at the mast, but its ballast spilled and the craft was rocked by unpredictable eddies. The near-disaster scuttled plans to turn the building's spire into an airship terminal, although one blimp did manage to make a single newspaper delivery afterward. In 1932, the Fifth Avenue Association gave the tower its 1931 "gold medal" for architectural excellence, signifying that the Empire State had been the best-designed building on Fifth Avenue to open in 1931. A year later, on March 2, 1933, the movie King Kong was released. The movie, which depicted a large stop motion ape named Kong climbing the Empire State Building, made the still-new building into a cinematic icon. On July 28, 1945, a B-25 Mitchell bomber crashed into the north side of the Empire State Building, between the 79th and 80th floors. One engine completely penetrated the building and landed in a neighboring block, while the other engine and part of the landing gear plummeted down an elevator shaft. Fourteen people were killed in the incident, but the building escaped severe damage and was reopened two days later. The Empire State Building only started becoming profitable in the 1950s, when it was finally able to break even for the first time. At the time, mass transit options in the building’s vicinity were limited compared to the present day. Despite this challenge, the Empire State Building began to attract renters due to its reputation. A 222-foot (68 m) radio antenna was erected on top of the tower starting in 1950, allowing the area's television stations to broadcast from the building. However, despite the turnaround in the building's fortunes, Raskob put the tower up for sale in 1951, with a minimum asking price of $50 million. The property was purchased by business partners Roger L. Stevens, Henry Crown, Alfred R. Glancy and Ben Tobin. The sale was brokered by the Charles F. Noyes Company, a prominent real estate firm in upper Manhattan, for $51 million, the highest price paid for a single structure at the time. By this time, the Empire State had been fully leased for several years with a waiting list of parties looking to lease space in the building, according to the Cortland Standard. That year, six news companies formed a partnership to pay a combined annual fee of $600,000 to use the tower's antenna, which was completed in 1953. Crown bought out his partners' ownership stakes in 1954, becoming the sole owner. The following year, the American Society of Civil Engineers named the building one of the "Seven Modern Civil Engineering Wonders". In 1961, Lawrence A. Wien signed a contract to purchase the Empire State Building for $65 million, with Harry B. Helmsley acting as a partner in the building's operating lease This became the new highest price for a single structure. Over 3,000 people paid $10,000 for one share each in a company called Empire State Building Associates. The company in turn subleased the building to another company headed by Helmsley and Wien, raising $33 million of the funds needed to pay the purchase price. In a separate transaction, the land underneath the building was sold to Prudential Insurance for $29 million. Helmsley, Wien, and Malkin quickly started a program of minor improvement projects, including the first-ever full-building facade refurbishment and window-washing in 1962, the installation of new flood lights on the 72nd floor in 1964, and replacement of the manually operated elevators with automatic units in 1966. The little-used western end of the second floor was used as a storage space until 1964, at which point it received escalators to the first floor as part of its conversion into a highly-sought retail area. In 1961, the same year that Helmsley, Wien, and Malkin had purchased the Empire State Building, the Port Authority of New York and New Jersey formally backed plans for a new World Trade Center in Lower Manhattan. The plan originally included 66-story twin towers with column-free open spaces. The Empire State's owners and real estate speculators were worried that the twin towers' 7,600,000 square feet (710,000 m2) of office space would create a glut of rentable space in Manhattan as well as take away the Empire State Building's profits from lessees. A revision in the World Trade Center's plan brought the twin towers to 1,370 feet (420 m) each or 110 stories, taller than the Empire State. Opponents of the new project included prominent real-estate developer Robert Tishman, as well as Wien's Committee for a Reasonable World Trade Center. In response to Wien's opposition, Port Authority executive director Austin J. Tobin said that Wien was only opposing the project because it would overshadow his Empire State Building as the world's tallest building. The World Trade Center's Twin Towers surpassed the Empire State Building in height by 1970. The World Trade Center's twin towers started construction in 1966. The following year, the Ostankino Tower succeeded the Empire State Building as the tallest freestanding structure in the world. In 1970, the Empire State surrendered its position as the world's tallest building, when the still under construction North Tower of the World Trade Center surpassed it, on October 19; the North Tower was topped out, on December 23, 1970. In December 1975, the observation deck was opened on the 110th floor of the Twin Towers, significantly higher than the 86th floor observatory on the Empire state. The Empire State Building was also losing revenue during this period, particularly as a number of broadcast stations had moved to the World Trade Center in 1971; although the Port Authority continued to pay the broadcasting leases for the Empire State until 1984. By 1980, there were nearly two million annual visitors, although a building official had previously estimated between 1.5 million and 1.75 million annual visitors. The building received its own ZIP code in May 1980 in a roll out of 63 new postal codes in Manhattan. At the time, the tenants of the tower collectively received 35,000 pieces of mail daily. The Empire State Building celebrated its 50th anniversary on May 1, 1981, with a much-publicized, but poorly received, laser light show, as well as an "Empire State Building Week" that ran through to May 8. The New York City Landmarks Preservation Commission voted to make the lobby a city landmark on May 19, 1981, citing the historic nature of the first and second floors, as well as "the fixtures and interior components" of the upper floors. The building became a National Historic Landmark in 1986 in close alignment to the New York City Landmarks report. That year, the Plaza Hotel and Metropolitan Museum of Art further uptown were also designated as National Historic Landmarks. The Empire State Building was added to the National Register of Historic Places the following year due to its architectural significance. From the early to mid 1990s, the building underwent a $55 million series of upgrades with the alarm systems, elevators, windows, and air conditioning being replaced, the 86th floor observation deck made accessible to disabled visitors, and the facade again refurbished. Prudential sold the land under the building in 1991 for $42 million to a buyer representing hotelier Hideki Yokoi, who was imprisoned at the time in connection with a deadly fire at the Hotel New Japan hotel in Tokyo. In 1994, Donald Trump entered into a joint-venture agreement with Yokoi, with a shared goal of breaking the Empire State Building’s lease on the land in an effort to gain total ownership of the building so that, if successful, the two could reap the potential profits of merging the ownership of the building with the land beneath it. Having secured a half-ownership of the land, Trump devised plans to take ownership of the building itself so he could renovate it, even though Helmsley and Malkin had already started their refurbishment project. He sued Empire State Building Associates in February 1995, claiming that the latter had caused the building to become a "high-rise slum" and a "second-rate, rodent-infested" office tower. Trump had intended to have Empire State Building Associates evicted for violating the terms of their lease, but was denied. this led to Helmsley's companies countersuing Trump in May. This sparked a series of lawsuits and countersuits that lasted several years, partly arising from Trump's desire to obtain the building's master lease by taking it from Empire State Building Associates. Upon Harry Helmsley's death in 1997, the Malkins sued Helmsley's widow, Leona Helmsley, for control of the building. With the destruction of the World Trade Center in the September 11 attacks in 2001, the Empire State Building again became the tallest building in New York City, but was only the second-tallest building in the Americas after the Willis Tower in Chicago. As a result of the attacks, transmissions from nearly all of the city's commercial television and FM radio stations were again broadcast from the Empire State Building. The attacks also led to an increase in security due to persistent terror threats against New York City landmarks. In 2002, Trump and Yokoi sold their land claim to the Empire State Building Associates, now headed by Malkin, in a $57.5 million sale. This action merged the building's title and lease for the first time in half a century. Despite the lingering threat posed by the 9/11 attacks, the Empire State Building remained popular with 3.5 million visitors to the observatories in 2004, compared to about 2.8 million in 2003. Although she maintained her ownership stake in the building until the post-consolidation IPO in October 2013, Leona Helmsley handed over day-to-day operations of the building in 2006 to Peter Malkin’s company. In 2008 the building was temporarily "stolen" by the New York Daily News to show how easy it was to transfer the deed on a property, since city clerks were not required to validate the submitted information, as well as to help demonstrate how fraudulent deeds could be used to obtain large mortgages and then have individuals disappear with the money. The paperwork submitted to the city included the names of Fay Wray, the famous star of King Kong, and Willie Sutton, a notorious New York bank robber. The newspaper then transferred the deed back over to the legitimate owners, who at that time were Empire State Land Associates. In 2009, an improvement campaign encompassing the building’s public areas was commenced, including improvements to the air conditioning systems, the building’s waterproofing, and extensive renovations to the observation decks and the main lobby (see § Major renovations). This included $120 million of energy efficient upgrades, which allowed the building to receive a gold Leadership in Energy and Environmental Design (LEED) rating in September 2011. The new One World Trade Center surpassed the Empire State Building as the tallest LEED-certified building when it opened in 2014. As of 2014[update] the building is owned by the Empire State Realty Trust with Anthony Malkin as Chairman, CEO, and President. Due to its status as a publicly-traded company, details regarding the trust’s profits are publicly available and accessible on its website. In August 2016, the Qatar Investment Authority (QIA) was issued new fully diluted shares equivalent to 9.9% of the trust; this investment gave them partial ownership of the entirety of the Empire State Realty Trust’s portfolio, and as a result, partial ownership of the Empire State Building. The trust's president John Kessler called it an "endorsement of the company's irreplaceable assets". The investment has been described by the real-estate magazine The Real Deal as "an unusual move for a sovereign wealth fund", as these funds typically buy direct stakes in buildings rather than real estate companies. Other foreign entities that have a stake in the Empire State Realty Trust include investors from Norway, Japan, and Australia. The height of the Empire State Building, to its 102nd floor, is 1,250 ft (381 m), 1,453 feet 8 9⁄16 inches (443.092 m) including its 203 ft (61.9 m) pinnacle. The building has 85 stories of commercial and office space representing a total of 2,158,000 sq ft (200,500 m2) of rentable space. It has an indoor and outdoor observation deck on the 86th floor, the highest floor within the actual tower. The remaining 16 stories are part of the Art Deco spire, which is capped by an observatory on the 102nd-floor. The spire is hollow with no floors between levels 86 and 102. Atop the tower is the 203 ft (61.9 m) pinnacle, much of which is covered by broadcast antennas, and surmounted with a lightning rod. According to the official fact sheets the building rises 1,860 steps from the first to the 102nd floor, weighs 365,000 short tons (331,122 t), has an internal volume of 37,000,000 cubic feet (1,000,000 m3), and an exterior with 200,000 cubic feet (5,700 m3) of limestone and granite. Construction of the tower's exterior required ten million bricks and 730 short tons (650 long tons) of aluminum and stainless steel, and the interior required 1,172 miles (1,886 km) of elevator cable and 2,000,000 feet (609,600 m) of electrical wires. The building has a capacity for 20,000 tenants and 15,000 visitors. The building has been named as one of the Seven Wonders of the Modern World by the American Society of Civil Engineers. The building and its street floor interior are designated landmarks of the New York City Landmarks Preservation Commission, and confirmed by the New York City Board of Estimate. It was designated as a National Historic Landmark in 1986. In 2007, it was ranked number one on the AIA's List of America's Favorite Architecture. The Empire State Building's art deco design is typical of pre–World War II architecture in New York. The modernistic, stainless steel canopies of the entrances on 33rd and 34th Streets lead to two-story-high corridors around the elevator core, crossed by stainless steel and glass-enclosed bridges at the second-floor level. The riveted steel frame of the building was originally designed to handle all of the building's gravitational stresses and wind loads. The exterior of the building is clad in Indiana limestone panels sourced from the Empire Mill in Sanders, Indiana, which give the building its signature blonde color. The amount of material used in the building's construction resulted in a very stiff structure when compared to other skyscrapers, with a structural stiffness of 42 pounds per square foot (2.0 kPa) versus the Willis Tower's 33 pounds per square foot (1.6 kPa) and the John Hancock Center's 26 pounds per square foot (1.2 kPa). A December 1930 feature in Popular Mechanics estimated that a building with the Empire State's dimensions would still stand even if hit with an impact of 50 short tons (45 long tons). The Empire State Building design featured one major setback and several smaller ones that reduce the level dimensions as the height increases, thus making upper 81 floors much smaller than the lower five floors. However, this design allows sunlight to illuminate the interiors of the top floors and, in addition, positions these floors away from the noisy streets below. This design was mandated as per the 1916 Zoning Resolution, which was intended to allow sunlight to reach the streets as well. [f] Normally, a building of the Empire State's dimensions would be permitted to build up to 12 stories on the Fifth Avenue side, and up to 17 stories on the 33rd/34th Streets side, before it would have to utilize setbacks. However, the setbacks were arranged such that the largest setback was on the sixth floor, above the five-floor "base", so the rest of the building above the sixth floor would have a facade of uniform shape. The Empire State Building was the first building to have more than 100 floors. It has 6,500 windows; 73 elevators; a total floor area of 2,768,591 sq ft (257,211 m2); and a base covering 2 acres (8,094 m2). Its original 64 elevators, built by the Otis Elevator Company, are located in a central core and are of varying heights, with the longest of these elevators reaching from the lobby to the 80th floor. As originally built, there were four "express" elevators that connected the lobby, 80th floor, and several landings in between; the other 60 "local" elevators connected the landings with the floors above these intermediate landings. Of the 64 total elevators, 58 were for passenger use (comprising the four express elevators and 54 local elevators), and eight were for freight deliveries. The elevators were designed to move at 1,200 feet per minute (366 m/min). At the time of the skyscraper's construction, their practical speed was limited to 700 feet per minute (213 m/min) as per city law, but this limit was removed shortly after the building opened. Additional elevators connect the 80th floor to the six floors above it, as the six extra floors were built after the original 80 stories were approved. The elevators were mechanically operated until 2011, when they were replaced with digital elevators during the $550 million renovation of the building. The Empire State Building has 73 elevators in all, including service elevators. Utilities are grouped in a central shaft. On each floor between levels 6 and 86, the central shaft is surrounded by a main corridor on all four sides. As per the final specifications of the building, the corridor is surrounded in turn by office space 28 feet (8.5 m) deep. Each of the floors has 210 structural columns that pass through it, which provide structural stability, but limits the amount of open space on these floors. However, the relative dearth of stone in the building allows for more space overall, with a 1:200 stone-to-building ratio in the Empire State compared to a 1:50 ratio in similar buildings. The original main lobby is accessed from Fifth Avenue, on the building's east side, and contains an entrance with one set of double doors between a pair of revolving doors. At the top of each doorway is a bronze motif depicting one of three "crafts or industries" used in the building's construction—Electricity, Masonry, and Heating. The lobby contains two tiers of marble, a lighter marble on the top, above the storefronts, and a darker marble on the bottom, flush with the storefronts. There is a pattern of zigzagging terrazzo tiles on the lobby floor, which leads from the entrance on the east to the aluminum relief on the west. The chapel-like three-story-high lobby, which runs parallel to 33rd and 34th Streets, contains storefronts on both its northern and southern sides. These storefronts are framed on each side by tubes of dark "modernistically rounded marble", according to the New York City Landmarks Preservation Commission, and above by a vertical band of grooves set into the marble. Immediately inside the lobby is an airport-style security checkpoint. The walls on both the northern and southern sides of the lobby house storefronts and escalators to a mezzanine level. [h] At the west end of the lobby is an aluminum relief of the skyscraper as it was originally built (i.e. without the antenna). The relief, which was intended to provide a welcoming effect, contains an embossing of the building's outline, accompanied by what the Landmarks Preservation Commission describes as "the rays of an aluminum sun shining out behind [the tower] and mingling with aluminum rays emanating from the spire of the Empire State Building". In the background is a state map of New York with the building's location marked by a "medallion" in the very southeast portion of the outline. A compass is located in the bottom right and a plaque to the tower's major developers is on the bottom left. Until the 1960s, an art deco mural, inspired by both the sky and the Machine Age, was installed in the lobby ceilings. Subsequent damage to these murals, designed by artist Leif Neandross, resulted in reproductions being installed. Renovations to the lobby in 2009, such as replacing the clock over the information desk in the Fifth Avenue lobby with an anemometer and installing two chandeliers intended to be part of the building when it originally opened, revived much of its original grandeur. The north corridor contained eight illuminated panels created in 1963 by Roy Sparkia and Renée Nemorov, in time for the 1964 World's Fair, depicting the building as the Eighth Wonder of the World alongside the traditional seven. The building's owners installed a series of paintings by the New York artist Kysa Johnson in the concourse level. Johnson later filed a federal lawsuit, in January 2014, under the Visual Artists Rights Act alleging the negligent destruction of the paintings and damage to her reputation as an artist. As part of the building's 2010 renovation, Denise Amses commissioned a work consisting of 15,000 stars and 5,000 circles, superimposed on a 13-by-5-foot (4.0 by 1.5 m) etched-glass installation, in the lobby. Capital improvements were made to the Empire State Building during the early to mid-1990s at a cost of $55 million. These improvements entailed replacing alarm systems, elevators, windows, and air conditioning; making the observation deck compliant with the Americans with Disabilities Act of 1990 (ADA); and refurbishing the limestone facade. The observatory renovation was added after disability rights groups and the United States Department of Justice filed a lawsuit against the building in 1992, in what was the first lawsuit filed by an organization under the new law. A settlement was reached in 1994, in which the Empire State Building Associates agreed to add ADA-compliant elements, such as new elevators, ramps, and automatic doors, during its ongoing renovation. The building's public areas received a $550 million renovation in 2009 with improvements to the air conditioning and waterproofing, renovations to the observation deck and main lobby, and relocation of the gift shop to the 80th floor. $120 million of the budget was spent on improving the energy efficiency of the building with the goal of reducing energy emissions by 38% within five years. For example, all of the windows were refurbished onsite into film-coated "superwindows" which block heat but pass light. Air conditioning operating costs on hot days were reduced, saving $17 million of the project's capital cost immediately and partially funding some of the other retrofits. The Empire State Building won a gold Leadership in Energy and Environmental Design (LEED) rating in September 2011, as well as the World Federation of Great Towers' Excellence in Environment Award for 2010. The building started undergoing a 10-year renovation in the 2010s to further improve energy efficiency, public areas, and amenities. In August 2018, in a move to improve the flow of visitor traffic, the main visitor's entrance was shifted to 20 West 34th Street as part of a major renovation of the observatory lobby. The new lobby includes several technological features, including large LED panels, digital ticket kiosks in nine languages, and a two-story architectural model of the building surrounded by two metal staircases. The first phase of the renovation, to be completed by 2019, would feature an updated exterior lighting system and digital hosts. The final stage of the building was the installation of a hollow mast, a 158-foot (48 m) steel shaft fitted with elevators and utilities, above the 86th floor. At the top would be a conical roof and the 102nd-floor docking station. The elevators would ascend 167 feet (51 m) from the 86th floor ticket offices to a 33-foot-wide (10 m) 101st-floor[g] waiting room. From there, stairs would lead to the 102nd floor,[g] where passengers would enter the airships. The airships would have been moored to the spire at the equivalent of the building's 106th floor. On the 102nd floor of the Empire State Building (formerly the 101st floor), there is a door with stairs ascending to the 103rd floor (formerly the 102nd). [g] This was built as a disembarkation floor for airships tethered to the building's spire, and has a circular balcony outside. It is now an access point to reach the spire for maintenance. The room now contains electrical equipment, but celebrities and dignitaries may also be given permission to take pictures there. Above the 103rd floor, there is a set of stairs and a ladder to reach the spire for maintenance work. The mast's 480 windows were all replaced in 2015. Antennae for broadcast stations are located at the top of the Building. Broadcasting began at the Empire State Building on December 22, 1931, when NBC and RCA began transmitting experimental television broadcasts from a small antenna erected atop the spire, with two separate transmitters for the visual and audio data. They leased the 85th floor and built a laboratory there. In 1934, RCA was joined by Edwin Howard Armstrong in a cooperative venture to test his FM system from the building's antenna. This setup, which entailed the installation of the world's first FM transmitter, continued only until October of the next year due to disputes between RCA and Armstrong. Specifically, NBC wanted to install more TV equipment in the room where Armstrong's transmitter was located. After some time, the 85th floor became home to RCA's New York television operations initially as experimental station W2XBS channel 1 then, from 1941, as commercial station WNBT channel 1 (now WNBC-TV channel 4). NBC's FM station, W2XDG, began transmitting from the antenna in 1940. NBC retained exclusive use of the top of the building until 1950 when the Federal Communications Commission (FCC) ordered the exclusive deal be terminated. The FCC directive was based on consumer complaints that a common location was necessary for the seven extant New York-area television stations to transmit from so that receiving antennas would not have to be constantly adjusted. Other television broadcasters would later join RCA at the building on the 81st through 83rd floors, often along with sister FM stations. Construction of a dedicated broadcast tower began on July 27, 1950, with TV, and FM, transmissions starting in 1951. The broadcast tower was completed by 1953. From 1951, six broadcasters agreed to pay a combined $600,000 per year for the use of the antenna. In 1965, a separate set of FM antennae was constructed ringing the 103rd floor observation area to act as a master antenna. The placement of the stations in the Empire State Building became a major issue with the construction of the World Trade Center Twin Towers in the late 1960s, and early 1970s. The greater height of the Twin Towers would reflect radio waves broadcast from the Empire State Building, eventually resulting in some broadcasters relocating to the newer towers instead of suing the developer, the Port Authority of New York and New Jersey. Even though the nine stations who were broadcasting from the Empire State Building were leasing their broadcast space until 1984, most of these stations moved to the World Trade Center as soon as it was completed in 1971. The broadcasters obtained a court order stipulating that the Port Authority had to build a mast and transmission equipment in the North Tower, as well as pay the broadcasters' leases in the Empire State Building until 1984. Only a few broadcasters renewed their leases in the Empire State Building. The September 11 attacks in 2001 destroyed the World Trade Center and the broadcast centers atop it, leaving most of the city's stations without a station for ten days until a temporary tower was built in Alpine, New Jersey. By October 2001, nearly all of the city's commercial broadcast stations (both television and FM radio) were again transmitting from the top of the Empire State Building. In a report that Congress commissioned about the transition from analog television to digital television, it was stated that the placement of broadcast stations in the Empire State Building was considered "problematic" due to interference from other nearby towers. 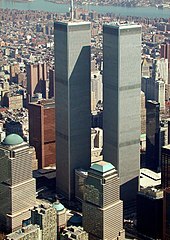 In comparison, the Congressional report stated that the former Twin Towers had very few buildings of comparable height nearby thus signals suffered little interference. In 2003, a few FM stations were relocated to the nearby Condé Nast Building to reduce the number of broadcast stations using the Empire State Building. Eleven television stations and twenty-two FM stations had signed 15-year leases in the building by May 2003. It was expected that a taller broadcast tower in Bayonne, New Jersey, or Governors Island, would be built in the meantime with the Empire State Building being used as a "backup" since signal transmissions from the building were generally of poorer quality. With the completion of 1 World Trade Center, some TV Stations began moving their transmitting facilities to 1 World Trade Center, while others, including WABC-TV remained at the Empire State Building, with no plans to consider a move to the new tower. The 86th and 102nd floors contain observatories, which see a combined average of 4 million visitors per year. Since opening, the observatories have been more popular than similar observatories at 30 Rockefeller Plaza, the Chrysler Building, the first One World Trade Center, or the Woolworth Building, despite being more expensive. Tourists must pay to visit the observation deck on the 86th floor; there is an additional charge to visit the 102nd floor. Other ticket options for visitors include scheduled access to view the sunrise from the observatory, a “premium” guided tour with VIP access, and the “AM/PM” package which allows for two visits in the same day. The 86th floor observatory contains both an enclosed section and a wide-open section. The 102nd floor observatory is completely enclosed and much smaller. The 102nd floor observatory was closed to the public from the late 1990s to 2005. The observation decks were redesigned in mid-1979. According to a 2010 report by Concierge.com, the five lines to enter the observation decks are "as legendary as the building itself". Concierge.com stated that there are five lines: the sidewalk line, the lobby elevator line, the ticket purchase line, the second elevator line, and the line to get off the elevator and onto the observation deck. However, in 2016, New York City's official tourism website, NYCgo.com, made note of only three lines: the security check line, the ticket purchase line, and the second elevator line. For an extra fee tourists can skip to the front of the line. The Empire State Building garners significant revenue from ticket sales for its observation decks, making more money from ticket sales than it does from renting office space during some years. A 360° panoramic view of New York City from the 86th-floor observation deck in spring 2005. East River is to the left, Hudson River to the right, south is near center. In early 1994, a motion simulator attraction was built on the 2nd floor, as a complement to the observation deck. The original cinematic presentation lasted approximately 25 minutes, while the simulation was about eight minutes. The ride had two incarnations. The original version, which ran from 1994 until around 2002, featured James Doohan, Star Trek's Scotty, as the airplane's pilot who humorously tried to keep the flight under control during a storm. After the World Trade Center terrorist attacks on September 11, 2001, the ride was closed. An updated version debuted in mid-2002, featuring actor Kevin Bacon as the pilot, with the new flight also going haywire. This new version served a more informative goal, as opposed to the old version's main purpose of entertainment, and contained details about the 9/11 attacks. The simulator received mixed reviews, with assessments of the ride ranging from "great" to "satisfactory" to "corny". The Skyride attraction permanently closed on December 31, 2015. The building was originally equipped with white searchlights atop the tower. They saw their first use in November 1932 when they lit up to signal Roosevelt's victory over Hoover in the presidential election of that year. These were later swapped for four "Freedom Lights" in 1956. In February 1964, flood lights were added on the 72nd floor to illuminate the top of the building at night so that the building could be seen from the World Fair later that year. The lights were shut off from November 1973 to July 1974 because of the energy crisis at the time. In 1976, the businessman Douglas Leigh suggested that Wien and Helmsley install 204 metal-halide lights, which were four times as bright as the 1,000 incandescent lights they were to replace. New red, white, and blue metal-halide lights were installed in time for the country's bicentennial that July. After the bicentennial, Helmsley retained the new lights due to the reduced maintenance cost, about $116 a year. Since 1976, the spire has been lit in colors chosen to match seasonal events and holidays. Organizations are allowed to make requests through the building's website. The building is also lit in the colors of New York-based sports teams on nights when they host games: for example, orange, blue, and white for the New York Knicks; red, white, and blue for the New York Rangers. It was twice lit in scarlet to support New Jersey's Rutgers University, once for a football game against the University of Louisville on November 9, 2006, and again on April 3, 2007 when the women's basketball team played in the national championship game. There have also been special occasions where the lights are modified from the usual schedule. After the eightieth birthday, and subsequent death, of Frank Sinatra in 1998, for example, the building was bathed in blue light to represent the singer's nickname "Ol' Blue Eyes". After actress Fay Wray, who starred in King Kong, died in September 2004, the building lights were extinguished for 15 minutes. The floodlights bathed the building in red, white, and blue for several months after the destruction of the World Trade Center in September 2001, then reverted to the standard schedule. On June 4, 2002, the Empire State Building donned purple and gold (the royal colors of Elizabeth II), in thanks for the United Kingdom playing the Star Spangled Banner during the Changing of the Guard at Buckingham Palace on September 12, 2001 (a show of support after the September 11 attacks). On January 13, 2012, the building was lit in red, orange, and yellow to honor the 60th anniversary of NBC program The Today Show. From June 1 to 3, 2012, the building was lit in blue and white, the colors of the Israeli flag, in honor of the 49th annual Celebrate Israel Parade. During 2012, the building's four hundred metal halide lamps and floodlights were replaced with 1,200 LED fixtures, increasing the available colors from nine to over 16 million. The computer-controlled system allows the building to be illuminated in ways that were unable to be done previously with plastic gels. For instance, on November 6, 2012, CNN used the top of the Empire State Building as a scoreboard for the 2012 United States presidential election. When incumbent president Barack Obama had reached the 270 electoral votes necessary to win re-election, the lights turned blue, representing the color of Obama's Democratic Party. Had Republican challenger Mitt Romney won, the building would have been lit red, the color of the Republican Party. Also, on November 26, 2012, the building had its first ever synchronized light show, using music from recording artist Alicia Keys. Artists such as Eminem and OneRepublic have been featured in later shows, such as the building’s annual Holiday Music-to-Lights Show. The building's owners adhere to strict standards in using the lights; for instance, they do not use the lights to play advertisements. 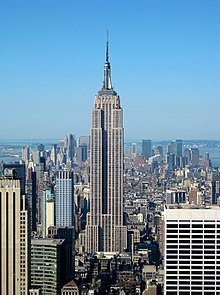 The longest world record held by the Empire State Building was for the tallest skyscraper (to structural height), which it held for 42 years until it was surpassed by the North Tower of the World Trade Center in October 1970. The Empire State Building was also the tallest man-made structure in the world before it was surpassed by the Griffin Television Tower Oklahoma (KWTV Mast) in 1954, and the tallest freestanding structure in the world until the completion of the Ostankino Tower in 1967. An early-1970s proposal to dismantle the spire and replace it with an additional 11 floors, which would have brought the building's height to 1,494 feet (455 m) and made it once again the world's tallest at the time, was considered but ultimately rejected. With the destruction of the World Trade Center in the September 11 attacks, the Empire State Building again became the tallest building in New York City, and the second-tallest building in the Americas, surpassed only by the Willis Tower in Chicago. The Empire State Building remained the tallest building in New York until the new One World Trade Center reached a greater height in April 2012. As of July 2018[update], it is the fourth-tallest building in New York City after One World Trade Center, 432 Park Avenue, and 30 Hudson Yards. It is the fifth-tallest completed skyscraper in the United States behind the two other tallest buildings in New York City, as well as the Willis Tower and Trump International Hotel and Tower in Chicago. The Empire State Building is the 28th-tallest in the world as of October 2017[update], the tallest being Burj Khalifa in Dubai. It is also the sixth-tallest freestanding structure in the Americas behind the five tallest buildings and the CN Tower. At 9:40 am on July 28, 1945, a B-25 Mitchell bomber, piloted in thick fog by Lieutenant Colonel William Franklin Smith Jr., crashed into the north side of the Empire State Building between the 79th and 80th floors where the offices of the National Catholic Welfare Council were located. One engine completely penetrated the building, landing on the roof of a nearby building where it started a fire that destroyed a penthouse. The other engine and part of the landing gear plummeted down an elevator shaft causing a fire, which was extinguished in 40 minutes. Fourteen people were killed in the incident. Elevator operator Betty Lou Oliver survived a plunge of 75 stories inside an elevator, which still stands as the Guinness World Record for the longest survived elevator fall recorded. Despite the damage and loss of life, the building was open for business on many floors two days later. The crash helped spur the passage of the long-pending Federal Tort Claims Act of 1946, as well as the insertion of retroactive provisions into the law, allowing people to sue the government for the incident. Also as a result of the crash, the Civil Aeronautics Administration enacted strict regulations regarding flying over New York City, setting a minimum flying altitude of 2,500 feet (760 m) above sea level regardless of the weather conditions. A year later, on July 24, 1946, another aircraft narrowly missed striking the building. The unidentified twin-engine plane scraped past the observation deck, scaring the tourists there. On January 24, 2000, an elevator in the building suddenly descended 40 stories after a cable that controlled the cabin's maximum speed was severed. The elevator fell from the 44th floor to the fourth floor, where a narrowed elevator shaft provided a second safety system. Despite the 40-floor fall, both of the passengers in the cabin at the time were only slightly injured. Since that elevator had no fourth-floor doors, the passengers were rescued by an adjacent elevator. After the fall, building inspectors reviewed all of the building's elevators. Because of the building's iconic status, it and other Midtown landmarks are popular locations for suicide attempts. More than 30 people have attempted suicide over the years by jumping from the upper parts of the building, with most attempts being successful. The first suicide from the building occurred on April 7, 1931, before the tower was even completed, when a carpenter who had been laid-off went to the 58th floor and jumped. The first suicide after the building's opening occurred from the 86th floor observatory in February 1935, when Irma P. Eberhardt fell 1,029 feet (314 m) onto a marquee sign. On December 16, 1943, William Lloyd Rambo jumped to his death from the 86th floor, landing amidst Christmas shoppers on the street below. In the early morning of September 27, 1946, shell-shocked Marine Douglas W. Brashear Jr. jumped from the 76th-floor window of the Grant Advertising Agency; police found his shoes 50 feet (15 m) from his body. On May 1, 1947, Evelyn McHale leapt to her death from the 86th floor observation deck and landed on a limousine parked at the curb. Photography student Robert Wiles took a photo of McHale's oddly intact corpse a few minutes after her death. The police found a suicide note among possessions that she left on the observation deck: "He is much better off without me.... I wouldn't make a good wife for anybody". The photo ran in the May 12, 1947 edition of Life magazine and is often referred to as "The Most Beautiful Suicide". It was later used by visual artist Andy Warhol in one of his prints entitled Suicide (Fallen Body). A 7-foot (2.1 m) mesh fence was put up around the 86th floor terrace in December 1947 after five people tried to jump during a three-week span in October and November of that year. By then, sixteen people had died from suicide jumps. Only one person has jumped from the upper observatory. Frederick Eckert of Astoria ran past a guard in the enclosed 102nd floor gallery on November 3, 1932 and jumped a gate leading to an outdoor catwalk intended for dirigible passengers. He landed and died on the roof of the 86th floor observation promenade. Two people have survived falls by not falling more than a floor. On December 2, 1979, Elvita Adams jumped from the 86th floor, only to be blown back onto a ledge on the 85th floor by a gust of wind and left with a broken hip. On April 25, 2013, a man fell from the 86th floor observation deck, but he landed alive with minor injuries on an 85th-floor ledge where security guards brought him inside and paramedics transferred him to a hospital for a psychiatric evaluation. Two fatal shootings have occurred in the direct vicinity of the Empire State Building. Abu Kamal, a 69-year-old Palestinian teacher, shot seven people on the 86th floor observation deck during the afternoon of February 23, 1997. He killed one person and wounded six others before committing suicide. Kamal reportedly committed the shooting in response to events happening in Palestine and Israel. On the morning of August 24, 2012, 58-year-old Jeffrey T. Johnson shot and killed a former co-worker on the building's Fifth Avenue sidewalk. He had been laid off from his job in 2011. Two police officers confronted the gunman, and he aimed his firearm at them. They responded by firing 16 shots, killing him but also wounding nine bystanders. Most of the injured were hit by bullet fragments, although three took direct hits from bullets. As the tallest building in the world and the first one to exceed 100 floors, the Empire State Building immediately became an icon of the city and of the nation. In 2013, Time magazine noted that the Empire State Building "seems to completely embody the city it has become synonymous with". The historian John Tauranac calls the tower "'the' twentieth-century New York building", despite the existence of taller and more modernist buildings. Early in the building's history, travel companies such as Short Line Motor Coach Service and New York Central Railroad used the building as an icon to symbolize the city. After the construction of the first World Trade Center, architect Paul Goldberger noted that the Empire State Building "is famous for being tall, but it is good enough to be famous for being good." As an icon of the United States, it is also very popular among Americans. In a 2007 survey, the American Institute of Architects found that the Empire State Building was "America's favorite building". The building was originally a symbol of hope in a country devastated by the Depression, as well as a work of accomplishment by newer immigrants. The writer Benjamin Flowers states that the Empire State was "a building intended to celebrate a new America, built by men (both clients and construction workers) who were themselves new Americans." The architectural critic Jonathan Glancey refers to the building as an "icon of American design". The Empire State Building has been hailed as an example of a "wonder of the world" due to the massive effort expended during construction. The Washington Star listed it as part of one of the "seven wonders of the modern world" in 1931, while Holiday magazine wrote in 1958 that the Empire State's height would be taller than the combined heights of the Eiffel Tower and the Great Pyramid of Giza. The American Society of Civil Engineers also declared the building "A Modern Civil Engineering Wonder of the United States" in 1958, and one of the Seven Wonders of the Modern World in 1994. Ron Miller, in a 2010 book, also described the Empire State Building as one of the "seven wonders of engineering". It has often been called the Eighth Wonder of the World as well, an appellation that it has held since shortly after opening. The panels installed in the lobby in 1963 reflected this, showing the seven original wonders alongside the Empire State Building. As an icon of New York City, the Empire State Building has been featured in various films, books, TV shows, and video games. According to the building's official website, more than 250 movies contain depictions of the Empire State Building. In his book about the building, John Tauranac writes that the first documented appearance of the tower in popular culture was Swiss Family Manhattan, a 1932 children's story by Christopher Morley. A year later, the film King Kong depicted Kong, a large stop motion ape that climbs the Empire State Building, bringing the building into the popular imagination. Later movies such as An Affair to Remember (1957), Sleepless in Seattle (1993), and Independence Day (1996) also featured the building. The building has also been featured in other works, such as "Daleks in Manhattan", a 2007 episode of the TV series Doctor Who; and Empire, an eight-hour black-and-white silent film by Andy Warhol, which was later added to the Library of Congress's National Film Registry. The Empire State Building Run-Up, a foot race from ground level to the 86th-floor observation deck, has been held annually since 1978. Its participants are referred to both as runners and as climbers, and are often tower running enthusiasts. The race covers a vertical distance of 1,050 feet (320 m) and takes in 1,576 steps. The record time is 9 minutes and 33 seconds, achieved by Australian professional cyclist Paul Crake in 2003, at a climbing rate of 6,593 ft (2,010 m) per hour. ESRT began trading publicly on the New York Stock Exchange on October 2, 2013. ^ The tenants' entrance is located at 350 Fifth Avenue, while the visitors' entrance is located at 20 West 34th Street. ^ a b The Empire State Building is located within the 10001 zip code area, but 10118 has been assigned as the building's own zip code by the United States Postal Service since 1980. ^ a b Most sources state that there are 102 floors, but some give a figure of 103 floors due to the presence of a balcony above the 102nd floor. See § Opening and early years and § Above the 102nd floor for a detailed explanation. ^ Some sources say that this purchase was made for $2,600. ^ Some sources say the farm may have been purchased by Charles Lawton for $10,000 in 1825 and by John Jacob Astor's son William Backhouse Astor Sr. in 1827, but others say John Jacob bought Thompson's farm directly in 1826. This conflates John's purchase of the entire parcel with William's subsequent purchase of a half-interest that included the current Empire State Building's land. ^ a b As per the 1916 Zoning Act, the wall of any given tower that faces a street could only rise to a certain height, proportionate to the street's width, at which point the building had to be set back by a given proportion. This system of setbacks would continue until the tower reaches a floor level in which that level's floor area was 25% that of the ground level's area. After that 25% threshold was reached, the building could rise without restriction. The 1916 Zoning Act was amended in 1961 so that buildings erected thereafter could not exceed a floor area ratio that was calculated for each zoning district. The maximum ratio for the Empire State Building's district is 15, unless it includes a public plaza. A grandfather clause permits preexisting structures to continue under the old rule. Therefore, the Empire State Building's floor area ratio of 25 cannot be duplicated, or even approached, by a new building in that district. ^ a b c d The 101st floor was later renamed the 102nd floor and is 101 floors above ground. The former 102nd floor, now the 103rd floor, is now a balcony that is off-limits to the public, and is 102 floors above ground. ^ a b See Landmarks Preservation Commission 1981, PDF page 26, for a diagram of the lobby. ^ a b c d e "Empire State Building unveils new entrance, lobby". am New York. August 22, 2018. Retrieved October 11, 2018. ^ a b c d e f g Jackson 2010, p. 413. ^ a b c d e f g h Langmead 2009, p. 86. ^ a b c "EMPIRE STATE TOWER, TALLEST IN WORLD, IS OPENED BY HOOVER; THE HIGHEST STRUCTURE RAISED BY THE HAND OF MAN" (PDF). The New York Times. May 2, 1931. ISSN 0362-4331. Retrieved October 23, 2017. ^ a b Fodor's; Sinclair, M. (1998). Exploring New York City. Fodor's Exploring Guides. Fodor's Travel Publications. p. 101. ISBN 978-0-679-03559-6. Retrieved October 25, 2017. ^ a b c Emporis GmbH. "Empire State Building, New York City – 114095 – EMPORIS". emporis.com. ^ National Geodetic Survey datasheet KU3602. Retrieved July 26, 2009. ^ a b c "Empire State Building". National Historic Landmark summary listing. National Park Service. September 11, 2007. Archived from the original on August 28, 2011. ^ a b c Edward Rothstein (July 15, 2011). "A View Inside King Kong's Perch". The Times. The New York Times Company. Retrieved May 27, 2013. The walkway circles around the building's narrow spire, which, in 1930, was envisioned as a mooring mast for dirigibles. ^ a b Reuters. "FACTBOX-History of New York's Empire State Building". chicagotribune.com. Retrieved November 27, 2018. ^ a b c Library, CNN. "Empire State Building Fast Facts". CNN. Retrieved November 27, 2018. ^ Jackson 2010, p. 414. ^ Tarquinio, J. Alex (September 9, 2009). "South of Midtown Manhattan, Bargain Commercial Rents". The New York Times. Retrieved October 22, 2017. ^ Kravitz, Derek (October 23, 2015). "Midtown South: Living Where the Action Is". Wall Street Journal. Retrieved October 22, 2017. ^ a b Verrill, Courtney (May 1, 2016). "14 weird facts that you probably didn't know about the Empire State Building". Business Insider. Retrieved October 22, 2017. ^ a b "The plane crash of '45, more Empire State Building secrets". am New York. Newsday. April 25, 2016. Retrieved October 22, 2017. ^ Sederstrom, Jonathan (September 18, 2012). "One World Trade Center Won't Get an Exclusive Zip Code: USPS Officials". Commercial Observer. Retrieved October 22, 2017. 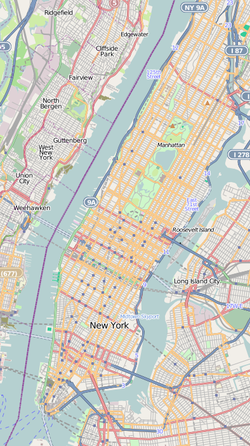 ^ "Manhattan Zip Code Map". nyc.gov. New York City Department of Housing Preservation and Development. ^ a b "Manhattan Adding 63 ZIP Codes; Empire State Gets Own Code" (PDF). The New York Times. May 1, 1980. ISSN 0362-4331. Retrieved October 31, 2017. ^ a b c d "MTA Neighborhood Maps: Pennsylvania Station / Times Square" (PDF). mta.info. Metropolitan Transportation Authority. 2018. Retrieved October 1, 2018. ^ Baldwin, Deborah (October 17, 2008). "Living In Koreatown Exotic Flavor, Beyond Just the Food". The New York Times. Retrieved September 25, 2011. Buckley, Cara (February 17, 2015). "Midtown's Lush Passage". The New York Times. Retrieved October 22, 2017. The location is five blocks from the Empire State Building. ^ a b c "MTA Neighborhood Maps: Herald Square / Murray Hill" (PDF). mta.info. Metropolitan Transportation Authority. 2015. Retrieved December 11, 2015. ^ Jackson 2010, p. 866. ^ McCarthy and Rutherford 1931, pp. 6, 7. ^ a b c d "TOWER SITE PART OF $2,400 FARM; 20-Acre Tract in 1799 Was the Scene of Fights With British-- Sold for $10,000 in 1805" (PDF). The New York Times. May 2, 1931. ISSN 0362-4331. Retrieved October 23, 2017. ^ McCarthy and Rutherford 1931, p. 5. ^ a b c d e "Historical Timeline". Empire State Building. Retrieved October 21, 2017. ^ a b c d Sperling, L.J. (2003). Famous Works of Art in Popular Culture: A Reference Guide. Greenwood Press. p. 124. ISBN 978-0-313-31808-5. Retrieved October 21, 2017. ^ a b Craven, Wayne (2009). Gilded Mansions: Grand Architecture and High Society. W.W. Norton & Company. p. 35. ISBN 978-0-393-06754-5. ^ Lewis, N.P. (1916). The Planning of the Modern City: A Review of the Principles Governing City Planning. John Wiley & Sons, Incorporated. p. 400. Retrieved October 21, 2017. ^ Commercial West. Financial Communications. 1911. p. 15-PA17. Retrieved October 21, 2017. ^ a b Morehouse 1991, p. 20. 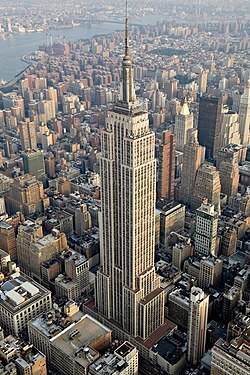 ^ "NATIONAL HISTORIC LANDMARK NOMINATION: EMPIRE STATE BUILDING". nps.gov. United States Department of the Interior; National Park Service. April 26, 1985. Retrieved October 21, 2017. ^ a b c d Douglas 2004, p. 108. ^ McCarthy and Rutherford 1931, p. 23. ^ McCarthy and Rutherford 1931, pp. 31–32. ^ a b c d "Hotel history". Waldorfnewyork.com. Archived from the original on November 27, 2013. Retrieved May 30, 2014. ^ McCarthy and Rutherford 1931, p. 77. ^ The American Architect and Building News Company (1898). American Architect and Architecture. 59–62 (Public domain ed.). Boston, Massachusetts: The American Architect and Building News Company. p. 3. ^ Tauranac 2014, p. 117. ^ "Coleman Du Pont Purchases The Waldorf–Astoria; Sale of Hotel Announced by George C. Boldt, Who Relinquishes Control Today" (PDF). The New York Times. February 3, 1918. Retrieved October 24, 2017. ^ a b Tauranac 2014, p. 118. ^ a b c Douglas 2004, p. 109. ^ a b c Willis & Friedman 1998, pp. 85–87. ^ a b c d e f g h i j k l Langmead 2009, p. 81. ^ a b c d Al-Kodmany 2017, p. 72. ^ Langmead 2009, p. 79. ^ a b c d e f "SMITH TO HELP BUILD HIGHEST SKYSCRAPER; Ex-Governor Heads Group That Will Put 80-Story Office Building on Waldorf Site. COST PUT AT $60,000,000 He Will Be President and Have Executive Control of Concern Yet to Be Incorporated. Directors of New Company. To Be Nearly 1,000 Feet High. SMITH TO HELP BUILD HIGH SKYSCRAPER" (PDF). The New York Times. August 30, 1929. ISSN 0362-4331. Retrieved October 22, 2017. ^ a b c Langmead 2009, p. 80. ^ a b Langmead 2009, p. 89. ^ Bascomb 2004, pp. 246–247. ^ Wagner 2003, p. 12. ^ a b Tauranac 2014, p. 157. ^ a b c d e f g Willis & Friedman 1998, p. 14. ^ Tauranac 2014, p. 129. ^ a b Tauranac 2014, p. 130. ^ a b c Tauranac 2014, p. 131. ^ "ENLARGES SITE FOR 1,000-FOOT BUILDING; Empire State Adds 75 Feet in 33d Street to the Waldorf Hotel Plot" (PDF). The New York Times. November 19, 1929. Retrieved October 24, 2017. ^ a b Goldman 1980, pp. 31–32. ^ a b Bascomb 2004, p. 235. ^ a b Bascomb 2004, p. 247. ^ a b Tauranac 2014, p. 185. ^ "SMITH SKYSCRAPER HAS A NOVEL DESIGN; Setbacks of the Empire State Building Will Begin With the Sixth Story. LIFTS IN CENTRE CYLINDER Plan Will Save Space and Assure Light, and Air to Neighbors-- Mooring Mast Offers Problems" (PDF). The New York Times. 1930. ISSN 0362-4331. Retrieved December 8, 2017. ^ a b c Dupre, Judith (2013). Skyscrapers: A History of the World's Most Extraordinary Buildings. Hachette Books. pp. 38–39. ISBN 978-1-57912-942-2. Retrieved October 23, 2017. ^ a b c d Bartlett, Kay (March 14, 1976). "Empire State Building Challenged" (PDF). Utica Observer. Utica, New York: Associated Press. p. 9E. Retrieved October 23, 2017 – via Fultonhistory.com. ^ a b Willis 1995, p. 95. ^ Langmead 2009, p. 90. ^ Jackson 2010, p. 1230. ^ Flowers 2001, p. 17. ^ a b Willis & Friedman 1998, p. 46. ^ "Homer G. Balcom, Engineer, Is Dead" (PDF). The New York Times. July 5, 1938. Retrieved August 8, 2011. ^ Langmead 2009, p. 84. ^ "RAZING OF WALDORF STARTED BY SMITH; Ceremony on Roof Marks the Beginning of Demolition of Historic Hotel. ITS EARLY DAYS RECALLED Former Governor Tells of "Digging Out" Fashionable Guests to Serve on Juries" (PDF). The New York Times. October 2, 1929. ISSN 0362-4331. Retrieved October 22, 2017. ^ Tauranac 2014, pp. 198–199. ^ Tauranac 2014, p. 200. ^ Douglas 2004, p. 111. ^ a b Tauranac 2014, p. 268. ^ "APPROVES $27,500,000 FOR SMITH PROJECT; Metropolitan Life Grants Loan to the Empire State Building Company" (PDF). The New York Times. December 14, 1929. ISSN 0362-4331. Retrieved October 22, 2017. ^ Rasenberger 2009, pp. 394–395. ^ "STEEL CONTRACT LET. ; Empire State Building to Require Total of 50,000 Tons" (PDF). The New York Times. January 12, 1930. Retrieved October 27, 2017. ^ a b c Langmead 2009, p. 85. ^ Tauranac 2014, p. 203. ^ a b Tauranac 2014, p. 205. ^ "EXCAVATING FINISHED FOR SMITH BUILDING; Steel Construction on Empire State Structure Here Will Begin on March 15" (PDF). The New York Times. March 6, 1930. Retrieved October 27, 2017. ^ a b Tauranac 2014, p. 207. ^ Tauranac 2014, p. 206. ^ Bascomb 2004, p. 248. ^ "STANDARDS FOR STEEL EASED IN NEW CITY LAW; Bill Signed by Walker Allows 18,000-Pound Stress to the Square Inch" (PDF). The New York Times. March 26, 1930. Retrieved October 27, 2017. ^ "Start Empire State Building Frame" (PDF). The New York Times. April 1, 1930. Retrieved October 27, 2017. ^ a b Tauranac 2014, p. 204. ^ Tauranac 2014, pp. 204–205. ^ a b c Poore, C.G. (July 27, 1930). "GREATEST SKYSCRAPER RISES ON A CLOCKWORK SCHEDULE; The Empire State Building Soars Upward, as a Modern Army Daily, Defeats Time, Far Above the Throngs on Fifth Avenue Some Staggering Figures. Preliminary Considerations. The Order of Progress. Design Speeds Erection. The Factors of Success" (PDF). The New York Times. ISSN 0362-4331. Retrieved October 23, 2017. ^ a b Tauranac 2014, p. 222. ^ Tauranac 2014, p. 223. ^ a b c Popular Mechanics & December 1930, p. 922. ^ Bascomb 2004, p. 246. ^ Rasenberger 2009, p. 396. ^ Tauranac 2014, p. 149. ^ a b c d Tauranac 2014, p. 212. 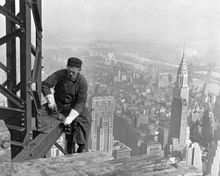 ^ "SMITH LAYS STONE FOR TALLEST TOWER; 5,000 Witness Ceremony as Former Governor Wields Trowel at Empire State Building. RECORDS SEALED IN BLOCK Head of Company Traces History of Site on Which 85-Story Office Structure is Being Erected" (PDF). The New York Times. September 10, 1930. Retrieved October 27, 2017. ^ a b Tauranac 2014, p. 213. ^ Willis & Friedman 1998, p. 164. ^ a b "Workers Raise Flag 1,048 Feet Above Fifth Av. As Steel Frame of Smith Building Is Finished" (PDF). The New York Times. September 20, 1930. Retrieved October 27, 2017. ^ "Empire State Tower Mast Up; Steel Workers Raise Flag" (PDF). The New York Times. November 22, 1930. Retrieved October 28, 2017. ^ a b Tauranac 2014, p. 214. ^ Tauranac 2014, p. 215. ^ a b Tauranac 2014, p. 208. ^ Tauranac 2014, pp. 213–214. ^ Willis & Friedman 1998, pp. 130–133. ^ a b Willis & Friedman 1998, p. 204. ^ Rasenberger 2009, pp. 390–391. ^ Weitzman, D. (2014). Skywalkers: Mohawk Ironworkers Build the City. Roaring Brook Press. pp. 85, 87–88. ISBN 978-1-4668-6981-3. Retrieved October 23, 2017. ^ Rasenberger 2009, p. 398. ^ a b Tauranac 2014, p. 221. ^ a b Flowers 2001, p. 72. ^ "Lewis Wickes Hine: The Construction of the Empire State Building, 1930–31 (New York Public Library Photography Collection)". New York Public Library. Archived from the original on February 21, 2009. Retrieved October 11, 2010. ^ Tauranac 2014, p. 283. ^ Tauranac 2014, pp. 283–284. ^ Rasenberger 2009, pp. 398–399. ^ a b c d e f g Young, William H.; Young, Nancy K. (2007). The Great Depression in America: A Cultural Encyclopedia. The Great Depression in America: A Cultural Encyclopedia. Greenwood Press. pp. 144–145. ISBN 978-0-313-33522-8. Retrieved October 25, 2017. ^ Langmead 2009, p. 87. ^ Tauranac 2014, pp. 227–228. ^ a b "EMPIRE STATE BUILDING OPEN" (PDF). Cortland Standard. Cortland, New York. May 2, 1931. p. 1. Retrieved October 23, 2017 – via Fultonhistory.com. ^ Tauranac 2014, p. 231. ^ "RIVALRY FOR HEIGHT IS SEEN AS ENDED" (PDF). The New York Times. May 2, 1931. ISSN 0362-4331. Retrieved October 23, 2017. ^ "75-STORY BUILDINGS FOUND ECONOMICAL; Advisable Where Land is $400 a Foot, Says W.C. Clark, S.W. Straus Economist. TESTS MADE BY ENGINEERS Skyscrapers of 150 Stories, 2,000 Feet in Height, Are Held to Be Structurally Possible" (PDF). The New York Times. September 22, 1929. ISSN 0362-4331. Retrieved October 23, 2017. ^ a b c Willis & Friedman 1998, p. 56. ^ a b c d Willis & Friedman 1998, p. 48. ^ Tauranac 2014, p. 271. ^ a b Winters, Patricia (July 17, 1994). "To Oldest Tenant, Empire State A Jewel". New York Daily News. Retrieved October 31, 2017 – via Chicago Tribune. ^ a b Ramirez, Anthony (June 30, 1996). "NEIGHBORHOOD REPORT: MIDTOWN;A Fixture at the Empire State". The New York Times. Retrieved October 31, 2017. ^ a b Martin, Douglas (January 13, 2008). "Jack Brod, Early Tenant of Skyscraper, Dies at 98". The New York Times. Retrieved October 31, 2017. ^ Tauranac 2014, pp. 273–274, 276, 279–280. ^ Tauranac 2014, p. 311. ^ Tauranac 2014, pp. 286–289. ^ Tauranac 2014, pp. 290–291. ^ a b Jackson 2010, p. 1326. ^ Tauranac 2014, p. 291. ^ Tauranac 2014, pp. 294–295. ^ a b c d e f Haskett, Thomas R. (August 1967). "BROADCAST ANTENNAS ON THE EMPIRE STATE BUILDING". Broadcast Engineering magazine: 24–31. ^ Tauranac 2014, p. 295. ^ a b c d e f g Langmead 2009, p. 82. ^ a b Jackson 2010, pp. 1344. ^ Tauranac 2014, p. 237. ^ a b Hearst Magazines (May 1931). Popular Mechanics. Hearst Magazines. p. 812. ^ Goldman 1980, p. 44. ^ a b Reingold, Lester A. (July 2000). "Airships and the Empire State Building—Fact and Fiction". Air & Space/Smithsonian. ^ "Throng Strains Necks as Blimp Tries to Kiss Empire State Mast". Brooklyn Daily Eagle. September 15, 1931. p. 3. Retrieved October 26, 2017 – via Newspapers.com. ^ a b "Blimp Moored to Tower of Empire State Building" (PDF). Daily Sentinel. Rome, New York: Associated Press. September 15, 1931. p. 1. Retrieved October 23, 2017 – via Fultonhistory.com. ^ "MOORS TO EMPIRE STATE. ; Small Dirigible Makes Brief Contact While Traffic Is Jammed Below" (PDF). The New York Times. September 16, 1931. Retrieved October 24, 2017. ^ "EMPIRE TOWER WINS 1931 FIFTH AV. PRIZE; Association Gives Its Medal and Diploma for Building's Architectural Excellence. SMITH PRAISES BACKERS Calls Structure Their Expression of Confidence in the Continued Growth of the City" (PDF). The New York Times. February 24, 1932. ISSN 0362-4331. Retrieved October 25, 2017. ^ a b Tauranac 2014, p. 25. ^ a b Langmead 2009, p. 72. ^ a b c Jackson 2010, pp. 413–414. ^ a b c d e Berman & Museum of New York City 2003, p. 86. ^ a b "Army Pushes Bomber Crash Investigation". Brooklyn Daily Eagle. July 30, 1945. p. 1. Retrieved October 26, 2017 – via Newspapers.com. ^ Tauranac 2014, p. 332. ^ Jackson 2010, pp. 1188. ^ a b "O'Dwyer Starts TV Tower Work" (PDF). Buffalo Courier-Express. Associated Press. July 28, 1950. Retrieved October 27, 2017 – via Fultonhistory.com. ^ "Empire State Tower Reported Near Sale". The New York Times. December 18, 1951. ISSN 0362-4331. Retrieved September 21, 2017. ^ a b c d "Appraiser's 'Inside' Helped Sell Empire State Building" (PDF). Jamestown Journal. Jamestown, New York: Associated Press. June 22, 1951. p. 1. Retrieved October 23, 2017 – via Fultonhistory.com. ^ a b c d e f g h Bagli, Charles V. (April 28, 2013). "Empire State Building Has a Tangled History". The New York Times. Retrieved September 21, 2017. ^ Saxon, Wolfgang (June 16, 1996). "Ben Tobin, 92, Investor in Hotels And in Real Estate". The New York Times. Retrieved January 16, 2019. ^ Nitkin, David (June 9, 1996). "BEN TOBIN, BOUGHT OR BUILT NOTABLE BROWARD BUILDINGS". Sun-Sentinel.com. Retrieved January 16, 2019. ^ Tauranac 2014, p. 366. ^ "EMPIRE STATE BUILDING WILL CHANGE HANDS" (PDF). Cortland Standard. Cortland, New York: Associated Press. May 26, 1951. p. 1. Retrieved October 23, 2017 – via Fultonhistory.com. ^ "DEAL IS CLOSED ON EMPIRE STATE; Col. Henry Crown Increases His Ownership to 100% in Famed Office Structure". The New York Times. October 15, 1954. ISSN 0362-4331. Retrieved September 21, 2017. ^ "Empire State Building Given Special Award". Chicago Tribune. December 29, 1955. p. 28. Retrieved October 26, 2017 – via Newspapers.com. ^ a b "Empire State Building". ASCE Metropolitan Section. Retrieved October 26, 2017. ^ a b c d "Empire State Sold; Price Is 65 Million; Empire State Building Bought By Syndicate for $65,000,000" (PDF). The New York Times. August 23, 1961. ISSN 0362-4331. Retrieved September 21, 2017. ^ "New Buyer to Sell Empire State To Prudential in Leaseback Deal" (PDF). The New York Times. August 24, 1961. ISSN 0362-4331. Retrieved September 21, 2017. ^ Tauranac 2014, p. 351. ^ "Tower at Empire State Getting First Cleaning" (PDF). The New York Times. August 3, 1962. Retrieved October 27, 2017. ^ a b Tauranac 2014, p. 353. "Top of the Empire State To Get New Floodlights". The New York Times. January 21, 1964. Retrieved October 26, 2017. Lelyveld, Joseph (February 23, 1964). "The Empire State to Glow at Night" (PDF). The New York Times. Retrieved July 10, 2010. ^ Tauranac 2014, pp. 352–353. ^ Tauranac 2014, p. 352. ^ "THE EMPIRE STATE GETS ESCALATORS". The New York Times. December 24, 1964. Retrieved October 26, 2017. ^ "355 Million World Trade Center Backed by Port Authority Study; 355 Million World Trade Center Backed by Port Authority Study" (PDF). The New York Times. March 12, 1961. Retrieved October 26, 2017. ^ Tauranac 2014, pp. 353–354. ^ a b Tauranac 2014, p. 354. ^ Ennis, Thomas W. (February 15, 1964). "CRITICS IMPUGNED ON TRADE CENTER". The New York Times. Retrieved October 26, 2017. ^ a b "World Trade Center Becomes World's Highest Building By 4 Feet". The New York Times. October 20, 1970. Retrieved October 26, 2017. ^ a b c "Trade Center 'Topped Out' With Steel Column 1,370 Feet Above Street". The New York Times. December 24, 1970. Retrieved October 26, 2017. ^ "Jackhammers Bite Pavement to Start Trade Center Job" (PDF). The New York Times. August 6, 1966. Retrieved October 26, 2017. ^ a b c d e "World Trade Center tower surpasses Empire State". CBS News. April 30, 2012. Retrieved October 22, 2017. ^ Berman & Museum of New York City 2003, pp. 105–106. ^ "Timeline: World Trade Center chronology". PBS – American Experience. Archived from the original on May 2, 2007. Retrieved May 15, 2007. ^ a b Tauranac 2014, pp. 356–357. ^ a b c Mouat, Lucia (November 28, 1979). "No Longer The Tallest, 'Most Famous' Building In World" (PDF). Olean Times-Herald. Monitor News Service. p. 14. Retrieved October 29, 2017 – via Fultonhistory.com. ^ Phelps, Timothy M. (May 1, 1981). "LIGHT SHOW MORE LIKE A FLICKER". The New York Times. Retrieved October 29, 2017. ^ "Empire State celebrates 50th year" (PDF). Auburn Citizen-Advertiser. United Press International. April 30, 1981. p. 1. Retrieved October 29, 2017 – via Fultonhistory.com. ^ a b c Landmarks Preservation Commission 1981, p. 16. ^ Landmarks Preservation Commission 1981, p. i. ^ a b Pitts, Carolyn (April 26, 1985). "Empire State Building" (PDF). National Historic Landmark Nomination. National Park Service. ^ Heller Anderson, Susan; Dunlap, David W. (July 1, 1986). "NEW YORK DAY BY DAY; 3 New U.S. Landmarks". The New York Times. ISSN 0362-4331. Retrieved October 26, 2017. "Asset Detail – Empire State Building". National Park Service. Retrieved October 30, 2017. ^ a b c Dunlap, David W. (July 8, 1994). "Trump Plans Revitalization Of Empire State Building". The New York Times. Retrieved October 31, 2017. ^ a b c Oser, Alan S. (July 21, 1996). "PERSPECTIVES;The Empire State Building's Two-Front Campaign". The New York Times. ISSN 0362-4331. Retrieved September 21, 2017. ^ "COMPANY NEWS; Empire State Buyer Found". The New York Times. November 1, 1991. ISSN 0362-4331. Retrieved September 21, 2017. ^ "Donald Trump's Failed and Fraught Attempt to Own the Empire State Building". 6sqft. Retrieved January 29, 2019. ^ a b Gilpin, Kenneth N. (February 17, 1995). "COMPANY NEWS; Trump Sues Empire State Building Management Company". The New York Times. ISSN 0362-4331. Retrieved September 21, 2017. ^ "Trump Loses Round in Empire State Suit". The New York Times. March 22, 1995. ISSN 0362-4331. Retrieved September 21, 2017. ^ Johnston, David Cay (May 31, 1995). "Helmsley, in a Countersuit Against Trump, Alleges a Conspiracy as Big as the Empire State". The New York Times. ISSN 0362-4331. Retrieved September 21, 2017. ^ Bagli, Charles V. (1997). "With Helmsley Death, Wife Faces Battle for Empire". The New York Times. ISSN 0362-4331. Retrieved September 21, 2017. ^ a b c Dunlap, David W. (April 30, 2012). "1 World Trade Center Will Reclaim the Sky in Lower Manhattan". The New York Times. Retrieved October 22, 2017. ^ a b "It's official: 1 WTC is New York's new tallest building". NY Daily News. April 30, 2012. Retrieved April 30, 2012. ^ a b Guerrero et al. 2002, p. 37. ^ Rashbaum, William K. (July 15, 2002). "Terror Makes All the World A Beat for New York Police". The New York Times. Retrieved October 31, 2017. ^ a b Bagli, Charles V. (March 19, 2002). "Partnership in Deal for Empire State Building". The New York Times. ISSN 0362-4331. Retrieved September 21, 2017. ^ Collins, Glenn (August 14, 2004). "Making Sense of New York, From 86 Stories Up; Views From the Empire State Building, Mapped Out in Steel". The New York Times. Retrieved October 31, 2017. ^ "HELMSLEY CAVES IN – EMPIRE STATE BLDG. WAR ENDS". New York Post. August 30, 2006. Retrieved September 21, 2017. ^ "It took 90 minutes to 'steal' the Empire State Building". NY Daily News. December 2, 2008. Retrieved June 16, 2017. ^ a b Cortese, Amy (October 5, 2008). "The Empire State Building Gets a Makeover". The New York Times. Retrieved October 27, 2017. ^ a b c d "2009 ULI Fall Meeting & Urban Land Expo — Green Retrofit: What Is Making This the Wave of the Future?" (PDF). Retrieved October 11, 2010. ^ a b c d Navarro, Mireya (April 7, 2009). "Empire State Building Plans Environmental Retrofit". The New York Times. Retrieved October 27, 2017. ^ a b c d Tauranac 2014, p. 368. ^ a b Bloomfield, Craig (September 13, 2011). "Empire State Building Achieves LEED Gold" (Press release). U.S. Green Building Council. Retrieved October 29, 2017. ^ "Empire State Realty Trust". Retrieved March 7, 2014. ^ "Empire State Realty Trust Announces $622 Million Investment by Qatar Investment Authority". Empire State Realty Trust - ESRT. Retrieved January 29, 2019. ^ a b Egan, Matt (August 24, 2016). "Qatar buys chunk of Empire State Building". CNNMoney. Retrieved January 18, 2017. ^ Putzier, Konrad (August 25, 2016). "Qatar's Empire State Building investment is rare move for foreign fund". The Real Deal New York. Retrieved January 18, 2017. ^ "Empire State Building Fact Sheet" (PDF). Empire State Realty. p. 1. ^ Nash, Eric (August 1999). Manhattan Skyscrapers. Princeton Architectural Press. p. 75. ISBN 9781568981819. ^ a b c Popular Mechanics & December 1930, p. 920. ^ "Empire State Building—Accompanying 7 photos, exterior and interior, from 1978" (PDF). National Register of Historic Places Inventory. National Park Service. April 26, 1985. ^ "America's FavoriteArchitecture" (PDF). NPR. The American Institute of Architects; Harris Interactive. 2007. Retrieved October 21, 2017. ^ a b Taranath 2016, p. 459. ^ Peterson, Iver (November 10, 1981). "LIMESTONE CENTER TURNS TO TOURISM". The New York Times. Archived from the original on May 24, 2015. Retrieved September 5, 2016. ^ Taranath 2016, p. 527. ^ Kayden & Municipal Art Society 2000, pp. 8–9. ^ Willis 1995, p. 67. ^ Willis, Carol (1992). Ward, David; Zunz, Olivier (eds.). "Form follows finance: The Empire State Building". Landscape of Modernity: Essays on New York City, 1900-1940: 181. ^ a b c d "SMITH SKYSCRAPER HAS A NOVEL DESIGN; Setbacks of the Empire State Building Will Begin With the Sixth Story. LIFTS IN CENTRE CYLINDER Plan Will Save Space and Assure Light, and Air to Neighbors-- Mooring Mast Offers Problems" (PDF). The New York Times. January 8, 1930. Retrieved October 24, 2017. ^ a b Willis 1995, p. 96. ^ a b c Tauranac 2014, p. 183. ^ Bonnier Corporation (April 1931). Popular Science. Bonnier Corporation. p. 44. ^ Popular Mechanics & December 1930, p. 921. ^ "Empire State Building To Get Modernized Elevators". CBS. June 16, 2011. Retrieved December 16, 2017. ^ Landmarks Preservation Commission 1981, p. 13. ^ a b c d Landmarks Preservation Commission 1981, p. 15. ^ Landmarks Preservation Commission 1981, pp. 12–13. ^ a b c Fodor's 2010, p. 153. ^ a b c Lepik, Andres (2008). Skyscrapers. Prestel. pp. 53–54. ISBN 978-3-7913-3992-4. Retrieved October 23, 2017. ^ Landmarks Preservation Commission 1981, p. 1. ^ Landmarks Preservation Commission 1981, p. 14. ^ a b Landmarks Preservation Commission 1981, pp. 12, 15. ^ Landmarks Preservation Commission 1981, p. 12. ^ a b Barron, James (September 22, 2009). "Overhead, a Lobby Is Restored to Old Glory". The New York Times. Archived from the original on March 6, 2014. Retrieved September 10, 2011. ^ a b Bosworth, Patricia (1984). Diane Arbus: A Biography. W. W. Norton & Company. p. 215. ISBN 9780393326611. ^ "Artist Files Suit Over Missing Empire State Building Paintings". New York Times. January 31, 2014. Retrieved February 1, 2014. ^ Barron, James (February 13, 2011). "Restored Lobby's Crowning Touch". The New York Times. ISSN 0362-4331. Retrieved November 6, 2017. ^ Andrews, Edmund L. (January 28, 1992). "Advocates of Disabled File Complaint About the Empire State Building". New York Times. Retrieved October 31, 2017. ^ "US v. Empire State Building of NYC" (TXT file) (Press release). United States Department of Justice. March 3, 1994. Retrieved October 31, 2017. ^ a b Lovins, Amory (March – April 2012). "A Farewell to Fossil Fuels". Foreign Affairs. ^ a b c "New York's Empire State Building Gets a Surprising Upgrade". Retrieved October 10, 2018. ^ a b Tauranac 2014, p. 186. ^ a b "Inaccessible New York: Up To The 103rd Floor Of The Empire State Building". CBS New York. June 6, 2011. Retrieved October 22, 2017. ^ Carlson, Jen (February 2, 2016). "Here's The View From The Private 103rd Balcony Of The Empire State Building". Gothamist. Archived from the original on November 5, 2017. Retrieved October 22, 2017. ^ Morris, Keiko (August 31, 2015). "Raising the Glass at the Empire State Building". Wall Street Journal. Retrieved October 25, 2017. ^ a b Zarkin, K.; Zarkin, M.J. (2006). The Federal Communications Commission: Front Line in the Culture and Regulation Wars. Understanding our government. Greenwood Press. pp. 109–110. ISBN 978-0-313-33416-0. Retrieved October 23, 2017. ^ a b c Lessing, L. (1956). Man of High Fidelity: Edwin Howard Armstrong: A Biography. Lippincott. p. 20. Retrieved October 23, 2017. ^ Radio Corporation of America (1943). Radio Age. Radio Corporation of America. p. 6. Retrieved October 23, 2017. ^ Tauranac 2014, p. 356. ^ Tauranac 2014, p. 357. ^ Guerrero et al. 2002, p. 36. ^ Cianci, P.J. (2013). High Definition Television: The Creation, Development and Implementation of HDTV Technology. McFarland, Incorporated, Publishers. p. 254. ISBN 978-0-7864-8797-4. Retrieved October 23, 2017. ^ Bagli, Charles V. (May 12, 2003). "Broadcasters Put Antennas In Midtown". The New York Times. Retrieved October 26, 2017. 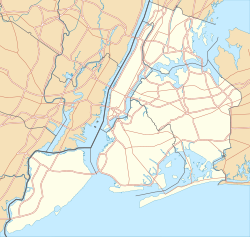 ^ "Radio stations in New York, NY". World Radio Map. Archived from the original on October 27, 2017. Retrieved October 26, 2017. ^ Al-Kodmany 2017, p. 71. ^ a b c Bagli, Charles V. (December 24, 2011). "Empire State Building Observation Decks Generate Startling Profits". The New York Times. ISSN 0362-4331. Retrieved October 24, 2017. ^ a b "ESB Tickets". Empire State Building. Retrieved July 10, 2010. ^ a b Fodor's 2010, p. 154. ^ "Ten Things Not to Do in New York". Concierge.com. Archived from the original on March 16, 2010. Retrieved October 23, 2010. ^ a b "Empire State Building Tickets – Observatory and Optional Skip the Line Tickets". The Official Guide to New York City. May 10, 2016. Retrieved December 11, 2017. ^ David Robertson (April 23, 2012). "No threat from large gorillas". The Times. Retrieved April 21, 2012. According to details prepared for the proposed initial public offering of Empire State Realty Trust, the skyscraper earned $62.9 million from its observation deck in nine months last year, compared with $62.6 million from the rental of office space. ^ Trucco, Terry (January 1, 1995). "TRAVEL ADVISORY: EMPIRE STATE BUILDING; New York on One Floor". The New York Times. Retrieved October 31, 2017. ^ a b "A Curious Flight Path". The New Yorker. November 5, 2001. Retrieved October 24, 2017. ^ Rosenberg, A.; Dunford, M. (2011). The Rough Guide to New York. Rough Guides. p. 128. ISBN 978-1-84836-590-2. Retrieved October 24, 2017. ^ VR World. Mecklermedia. 1994. p. 32. Retrieved October 24, 2017. ^ Michelin Tire Corporation (2002). New York City. Michelin green guides. Michelin Tire Corporation. p. 82. ISBN 978-2-06-100408-1. Retrieved October 24, 2017. ^ Fodor's New York City. Fodor's Travel Guides. Fodor's Travel. 2016. ISBN 978-0-8041-4370-7. Retrieved October 24, 2017. ^ Quay, Sara E.; Damico, Amy M. (2010). September 11 in Popular Culture: A Guide. Greenwood. p. 12. ISBN 978-0-313-35505-9. Retrieved October 31, 2017. ^ Kleinfield, N. R. (June 16, 2011). "Feud Over Views From the Empire State Building". The New York Times. Retrieved October 24, 2017. ^ "New York Skyride (New York City) - 2018 All You Need to Know BEFORE You Go (with Photos)". TripAdvisor. Retrieved December 5, 2018. ^ a b Melina, Remy (August 24, 2010). "What Do the Empire State Building's Lights Mean?". Live Science. Retrieved October 26, 2017. ^ a b City Lights. New York Magazine. New York Media, LLC. May 22, 1989. p. 35. ^ Berman & Museum of New York City 2003, p. 108. ^ "Tower Lights". Empire State Building. Retrieved October 25, 2017. "ESB to light up with NYCFC, Red Bulls colors". am New York. May 20, 2016. Retrieved October 26, 2017. Peters, Chris (April 25, 2016). "LOOK: Empire State Building lights up blue and orange for Islanders win". CBSSports.com. Retrieved October 26, 2017. ^ Schlabach, Mark (November 10, 2006). "Rutgers finds new level of success with win". ESPN. Retrieved July 10, 2010. ^ "Empire State Building turns blue as silent tribute". BBC News. May 15, 1998. Retrieved October 23, 2017. ^ Tallmer, Jerry (September 29, 2004). "Whatever Happened to Fay Wray?". The Villager. Archived from the original on May 12, 2011. Retrieved July 10, 2010. ^ "Lighting Schedule". Empire State Building. Archived from the original on September 20, 2001. Retrieved July 10, 2010. ^ "The Tallest Buildings in the World". The Washington Post. January 4, 2010. Retrieved July 10, 2010. ^ "TODAY celebrates 60 years!". NBC News. January 13, 2012. Retrieved October 26, 2017. ^ Benhorin, Yitzhak (June 3, 2012). "NYC celebrates Israel with annual parade". Ynetnews. Retrieved November 27, 2012. ^ Taub, Eric A. (May 8, 2012). "Bathed in New Lights, Empire State Building Will Star in More Vivid Show". City Room. Retrieved October 23, 2017. ^ a b Santora, Marc (July 6, 2013). "The Empire State Building, Now in 16 Million Colors". The New York Times. Retrieved October 23, 2017. ^ Wells, Charlie (November 6, 2012). "Empire State Building lights up to broadcast election results". Daily News. New York. Retrieved November 27, 2012. ^ "Empire State Building Light Show: LED Display Synchronized To Two Alicia Keys Songs Over Manhattan". Huffington Post. November 27, 2012. Retrieved November 27, 2012. ^ Wagmeister, Elizabeth; Wagmeister, Elizabeth (October 17, 2018). "How Eminem and Jimmy Kimmel Took Over the Empire State Building". Variety. Retrieved January 15, 2019. ^ McWhirter, N.; McWhirter, R. (1994). The Guinness Book of Records. Guinness Superlatives. p. 101. Retrieved October 22, 2017. ^ Carmody, Deirdre (October 11, 1972). "11 Floors May Be Added to the Empire State" (PDF). The New York Times. ^ "100 Tallest Buildings in the United States". The Skyscraper Center. April 7, 2016. Archived from the original on July 8, 2017. Retrieved October 22, 2017. ^ "100 Tallest Completed Buildings in the World". The Skyscraper Center. April 7, 2016. Archived from the original on October 18, 2017. Retrieved October 22, 2017. ^ "100 Tallest Towers in the World". The Skyscraper Center. April 7, 2016. Archived from the original on October 22, 2017. Retrieved October 22, 2017. ^ a b Glancey, Jonathan (June 13, 2013). "The Empire State Building: American icon". BBC. Retrieved October 23, 2017. ^ "The Americas Archived October 20, 2012, at the Wayback Machine." Air China. Retrieved on October 15, 2012. "New York AIR CHINA Ltd.(New York) Empire State Building 350 Fifth Avenue, Suite 6905 New York, NY 10118"
^ Pincus, Adam (April 27, 2012). "Boy Scouts move store out of Empire State Building". The Real Deal New York. Retrieved October 25, 2017. ^ a b c d e f "Empire State Building". Empire State Realty Trust. April 27, 2012. Retrieved December 5, 2018. 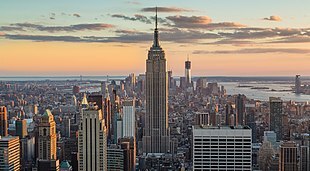 ^ "UPDATE 2-Coty expands in Empire State Building". Reuters. April 18, 2012. Retrieved October 25, 2017. ^ a b c d e "Foreigners flocking to 350 Fifth Avenue Archived October 14, 2008, at the Wayback Machine." Real Estate Weekly. June 30, 2004. ^ Rubenstein, Dana (July 7, 2009). "FDIC Signs Lease for Empire State Building". Observer. Retrieved October 25, 2017. ^ "Helios and Matheson Moved Principal Executive Office to Empire State Building". Retrieved July 18, 2018. ^ "About Us - HRF.org". HRF.org. Retrieved October 25, 2017. ^ "Contact". Archived September 28, 2008, at the Wayback Machine Human Rights Watch. Retrieved September 4, 2008. ^ "New York Empire State". Kaplan International. January 2, 2017. Retrieved December 9, 2017. ^ Weiss, Lois (January 6, 2011). "Empire expansion". New York Post. Retrieved October 25, 2017. ^ David M. Levitt (August 30, 2012). "The Tangled Tale Behind the Empire State Building's IPO". Businessweek. Retrieved December 9, 2017. ^ "Media General takes lease at Empire State Building". The Real Deal. January 28, 2015. Retrieved October 25, 2017. ^ "Pharma Firm Bolts Chrysler Building for Empire State". Observer. May 24, 2010. Retrieved October 25, 2017. ^ "25,000 Square Feet Of Pre-Builts Leased At The Empire State Building" (Press release). Empire State Realty Trust. May 5, 2014. Retrieved October 29, 2017. ^ "Turkish Airlines moves into Empire State Bldg". The Real Deal New York. February 14, 2011. Retrieved October 25, 2017. ^ "Dedicated to saving the world's most treasured places". World Monuments Fund. Retrieved October 25, 2017. ^ a b "Upper floors of tallest building blazing inferno". UPI. December 31, 1969. Retrieved December 4, 2018. ^ Buckley, Cara (December 20, 2008). "An Evangelical College in Manhattan, Where the Sin Is". The New York Times. Retrieved October 21, 2017. ^ "Contact Us Archived September 14, 2008, at the Wayback Machine." China National Tourist Office. Retrieved September 4, 2008. ^ "Contact us." National Film Board of Canada. Retrieved September 4, 2008. ^ Gladstein, M.R. (1999). The New Ayn Rand Companion. ABC-Clio ebook. Greenwood Press. p. 16. ISBN 978-0-313-30321-0. Retrieved December 28, 2017. ^ Tauranac 2014, p. 345. ^ "750th Squadron 457th Bombardment Group: Officers – 1943 to 1945". Retrieved April 6, 2009. ^ "CRASH FIRE RUINS SCULPTOR'S STUDIO; PHOTO-DIAGRAM OF THE PLANE CRASH" (PDF). The New York Times. July 29, 1945. ISSN 0362-4331. Retrieved October 24, 2017. ^ "Longest Fall Survived In An Elevator". Guinness World Records. Archived from the original on March 17, 2006. Retrieved October 11, 2010. ^ "The Day A Bomber Hit The Empire State Building". NPR. Retrieved July 28, 2008. Eight months after the crash, the U.S. government offered money to families of the victims. Some accepted, but others initiated a lawsuit that resulted in landmark legislation. The Federal Tort Claims Act of 1946, for the first time, gave American citizens the right to sue the federal government. ^ Tauranac 2014, p. 330. ^ "EMPIRE STATE PLANE STILL NOT IDENTIFIED" (PDF). The New York Times. July 26, 1946. ISSN 0362-4331. Retrieved October 21, 2017. ^ Chivers, C. J. (2000). "Elevator Cable Failed at Empire State Building, City Finds". The New York Times. ISSN 0362-4331. Retrieved October 21, 2017. ^ a b "Empire State Elevator Plummets 40 Floors". The New York Times. 2000. ISSN 0362-4331. Retrieved October 21, 2017. ^ Miller, Adam (January 25, 2000). "2 SURVIVE EMPIRE ST. ELEVATOR PLUNGE". New York Post. Retrieved October 21, 2017. ^ Gross, Charles; Piper, Tinka Markham; Bucciarelli, Angela; Tardiff, Kenneth; Vlahov, David; Galea, Sandro (November 2007). "Suicide Tourism in Manhattan, New York City, 1990–2004". Journal of Urban Health. 84 (6): 755–765. doi:10.1007/s11524-007-9224-0. ISSN 1099-3460. PMC 2232032. PMID 17885807. ^ "Lawyer dies in Empire suicide horror". NY Daily News. Retrieved October 26, 2017. ^ VanDam, Jeff (April 26, 2006). "An urban icon where they used to go fishing". The Herald Tribune. The New York Times. Archived from the original on February 12, 2009. ^ "KILLED IN 57-STORY FALL. ; Carpenter's Death at Empire State Building Believed to Be Suicide" (PDF). The New York Times. April 7, 1931. Retrieved October 28, 2017. ^ Tauranac 2014, p. 242. ^ "Youth Dives from Empire State Bldg". The Schenectady Gazette. December 17, 1943. Retrieved October 27, 2017. ^ "Leaps to Death from 76th Floor". Tuscaloosa News. September 27, 1946. Retrieved October 27, 2017. ^ "Picture of the Week". Life: 42–43. May 12, 1947. ISSN 0024-3019. Retrieved October 11, 2010. ^ a b "SAFETY GUARD COMPLETED ON THE EMPIRE STATE BUILDING" (PDF). The New York Times. December 5, 1947. ISSN 0362-4331. Retrieved October 26, 2017. ^ Reavill, Gil; Zimmerman, Jean (2003). Manhattan. Compass American Guides (4th ed.). New York: Compass American Guides. p. 160. ISBN 978-0-676-90495-6. ^ "Leaps to His Death Off Empire Tower" (PDF). The New York Times. November 4, 1932. Retrieved October 4, 2011. ^ Douglas, George H. (2004). Skyscrapers: A Social History of the Very Tall Building in America. London: McFarland. p. 173. ISBN 978-0-7864-2030-8. Retrieved October 11, 2010. ^ Broughton, Geoffrey (1987). Expressions. London: Collins ELT. p. 32. ISBN 0-00-370641-9. ^ Goldman 1980, p. 63. ^ Stepansky, Joseph; Kemp, Joe; Calcano, Bryan; Beekman, Daniel (April 25, 2013). "Man tumbles off Empire State Building". New York Daily News. Retrieved April 25, 2013. ^ Phillips, Jack (April 25, 2013). "Empire State Building Fall: Man Survives Plunge on 86th Floor". The Epoch Times. Retrieved October 27, 2017. ^ "Gunman shoots 7, kills self at Empire State Building". CNN. February 24, 1997. Archived from the original on April 20, 2010. Retrieved January 4, 2015. ^ Kleinfield, N. R. (February 25, 1997). "From Teacher to Gunman: U.S. Visit Ends in Fatal Rage". The New York Times. Retrieved December 23, 2017. ^ "Police: All Empire State shooting victims were wounded by officers". CNN. August 24, 2012. Retrieved January 4, 2015. ^ "The Empire State Building: A City Icon Turns 82 Amid Battle to Go Public". TIME. May 1, 2013. Retrieved October 25, 2017. ^ a b Tauranac 2014, p. 19. ^ Tauranac 2014, p. 20. ^ "Empire State Building is America's Favorite". Bloomberg. February 9, 2007. Retrieved October 25, 2017. ^ Miller, Ron (2010). Seven Wonders of Engineering. Seven Wonders. Ebsco Publishing. pp. 7–15. ISBN 978-0-7613-5989-0. Retrieved October 25, 2017. ^ Perez, Judith (May 1, 2012). "Empire State Building: The 8th World Wonder – A History in Photos". ABC News. Archived from the original on October 26, 2017. Retrieved October 25, 2017. ^ a b "TV & Movies". Empire State Building. Retrieved October 22, 2017. ^ Tauranac 2014, p. 24. ^ a b c Langmead 2009, p. 73. ^ "Complete National Film Registry Listing". National Film Preservation Board. Retrieved August 11, 2017. ^ "NYRR Empire State Building Run-Up Crowns Dold and Walsham as Champions". New York Road Runners. February 6, 2007. Archived from the original on July 16, 2011. Retrieved July 10, 2010. ^ "Past Race Winners". Empire State Building. Archived from the original on January 2, 2010. Retrieved July 10, 2010. ^ Yousuf, Hibah (October 2, 2013). "Empire State Building IPO disappoints". CNNMoney. Retrieved January 18, 2017. Al-Kodmany, Kheir (2017). Understanding Tall Buildings: A Theory of Placemaking. Understanding Tall Buildings: A Theory of Placemaking. Taylor & Francis. pp. 71–72. ISBN 978-1-317-60866-0. Retrieved October 23, 2017. Berman, J.S. ; Museum of the City of New York (2003). The Empire State Building. Portraits of America. Barnes and Noble Books. ISBN 978-0-7607-3889-4. Retrieved October 26, 2017. "Designation List 143 LP-2001" (PDF). Landmarks Preservation Commission. May 19, 1981. Retrieved October 23, 2017. Douglas, George H. (2004). Skyscrapers: A Social History of the Very Tall Building in America. McFarland. pp. 107–116. ISBN 978-0-7864-2030-8. Retrieved October 21, 2017. Flowers, Benjamin (2001). Skyscraper: The Politics and Power of Building New York City in the Twentieth Century. EBL-Schweitzer. University of Pennsylvania Press, Incorporated. ISBN 978-0-8122-0260-1. Retrieved October 25, 2017. Fodor's Travel Publications (2010). Fodor's See It New York City, 4th Edition. Fodor's See It New York City. Fodor's Travel Publications. ISBN 978-1-4000-0498-0. Retrieved October 24, 2017. Guerrero, P.F. ; Abramowitz, A.D.; Morrison, F. (2002). Telecommunications: Many Broadcasters Will Not Meet May 2002 Digital Television Dtv Deadline. Diane Publishing Company. ISBN 978-0-7567-2547-1. Retrieved October 23, 2017. Kayden, Jerold S.; The Municipal Art Society of New York (2000). Privately Owned Public Space: The New York City Experience. Wiley. ISBN 978-0-471-36257-9. Retrieved October 23, 2017. Langmead, Donald (2009). Icons of American Architecture: From the Alamo to the World Trade Center. Greenwood icons. Greenwood. pp. 71–92. ISBN 978-0-313-34207-3. Retrieved October 22, 2017. "Man's Mightiest Monument". Popular Mechanics. Hearst Magazines: 920–924. December 1930. McCarthy, James Remington; Rutherford, John (1931). Peacock alley: the romance of the Waldorf–Astoria. Harper. Morehouse, W. (1991). The Waldorf–Astoria: America's Gilded Dream. M. Evans. ISBN 978-0-87131-663-9. Retrieved December 28, 2017. Rasenberger, Jim (2009). High Steel: The Daring Men Who Built the World's Greatest Skyline, 1881 to the Present. HarperCollins. ISBN 978-0-06-174675-8. Retrieved October 21, 2017. Taranath, B.S. (2016). Structural Analysis and Design of Tall Buildings: Steel and Composite Construction. CRC Press. ISBN 978-1-4398-5090-9. Retrieved October 23, 2017. Willis, Carol (1995). Form Follows Finance: Skyscrapers and Skylines in New York and Chicago. Princeton Architectural Press. ISBN 978-1-56898-044-7. Retrieved October 23, 2017. James, Theodore Jr. (1975). The Empire State Building. New York: Harper & Row. ISBN 978-0-06-012172-3. Look up Empire State Building in Wiktionary, the free dictionary. Wikivoyage has a travel guide for Empire State Building.